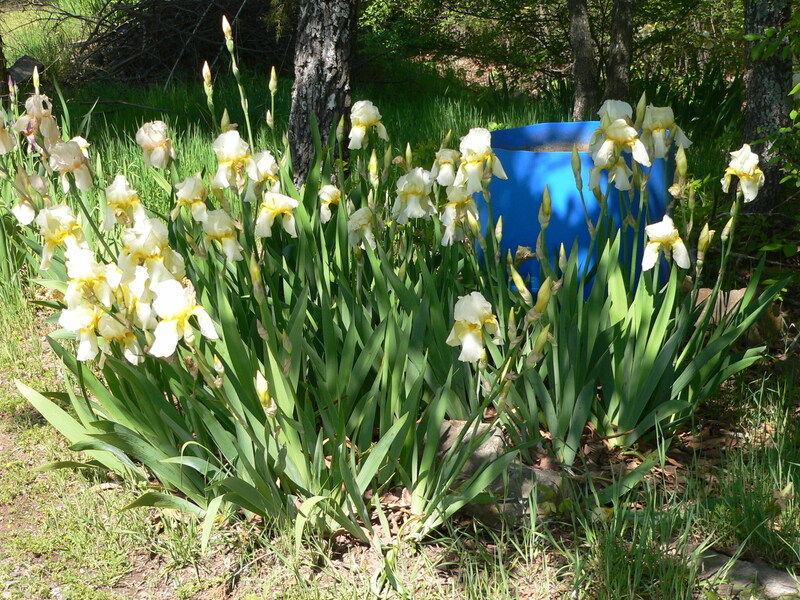 I was out working in the yard and took some pics of our remaining flowers. 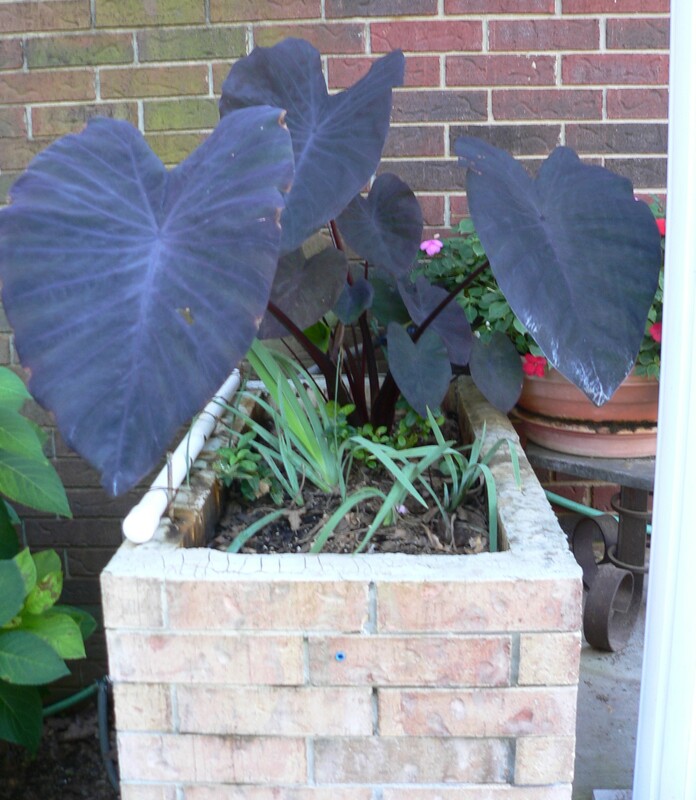 This is the black elephant ear my friend, Kay, gave me. 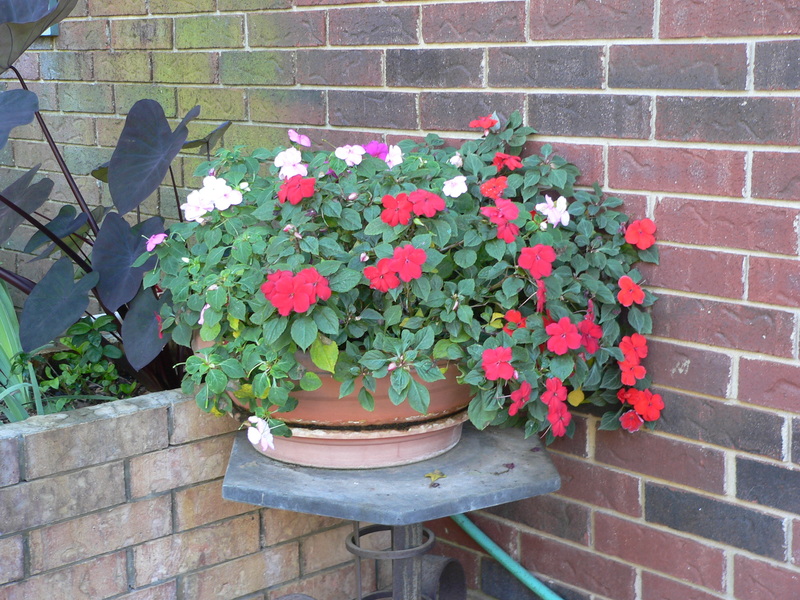 The Rio Samba rose only has one bloom on it now, but the impatiens around the bottom is still happy. And these are on the left side of the front door. 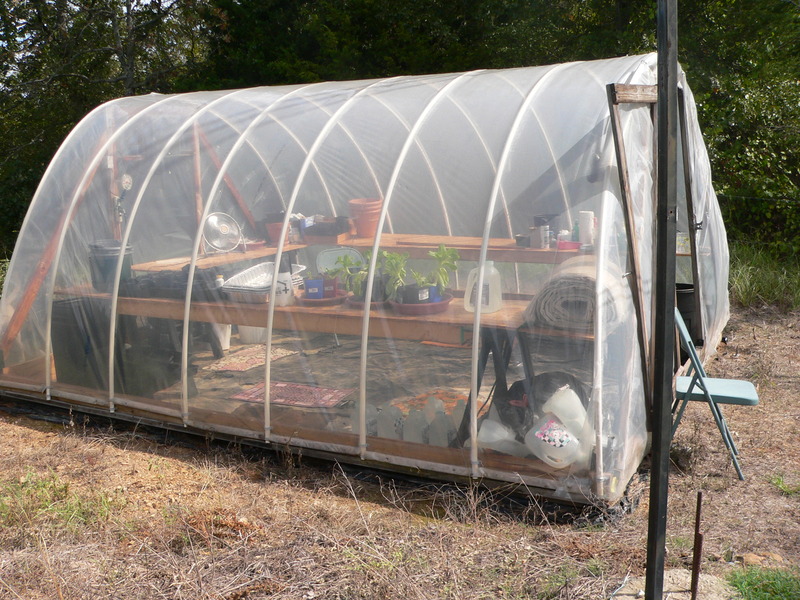 This is my greenhouse. I’m a bit embarrassed to tell you that I haven’t done much with it until recently. We run electricity out there with two super-long extension cords so that we can run the exhaust fan and a secondary fan, plus a light, if needed, but we don’t have cooling or heat, due to the expense. I’ve been trying to get it set up all summer long, but we actually lost a regular, bulb-type thermometer out there due to excess heat, even with both fans on and the door open. The thing simply blew its top – spewing the red stuff all over the place, as if someone with super colorful blood had died out there. The thermometer stopped at 120 degrees F., so I assume it was hotter than that. Needless to say, the heat in there was not conducive to me spending time out there, or even thinking about trying to grow anything. Now that our temperatures have cooled off, I’m having so much fun trying to see what I can do! 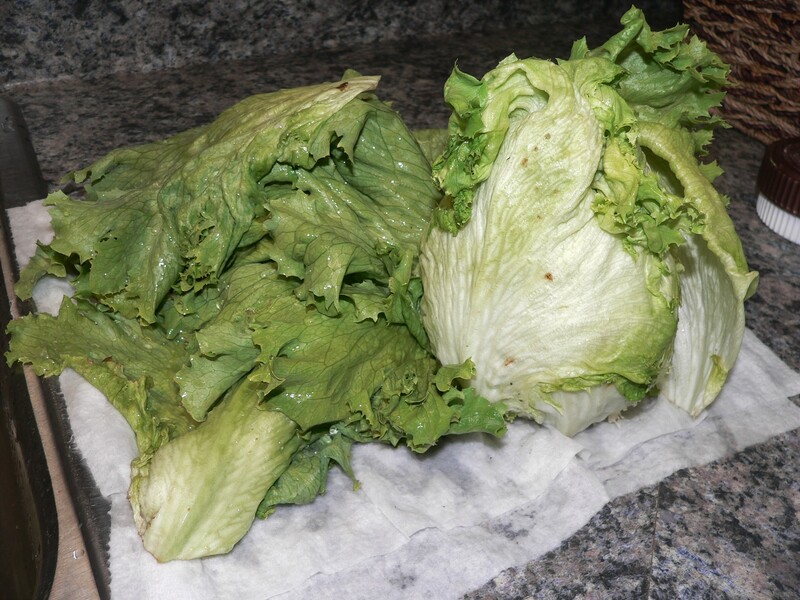 I have iceberg head lettuce growing (one set of plants bought when they were very small, and the other set bought when they were really leggy – almost too much to get planted.) I was very lucky to get those, so I’m doing what I can with them. 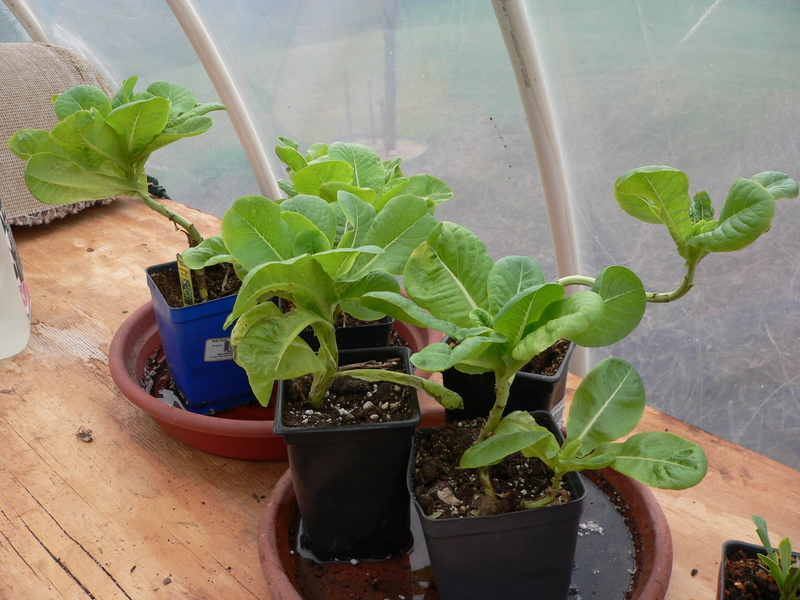 The three large pots hold the leggy lettuce plants. The 4 smaller pots have celery I started indoors. 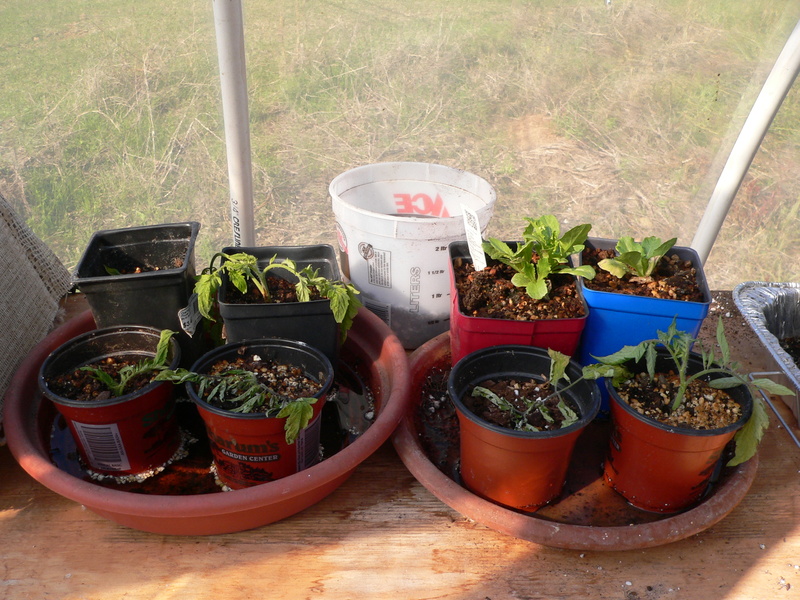 The two pots on the right at the top of the picture are what remains of the small lettuce plants. The rest are tomato suckers I gathered and planted. 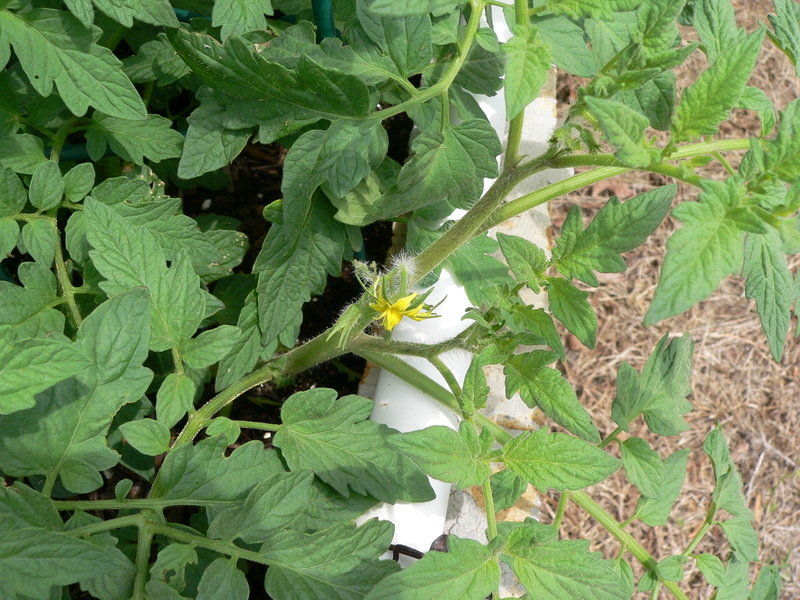 These are also tomato sucker plants. I have no clue what I’m doing, but I’m having a blast. 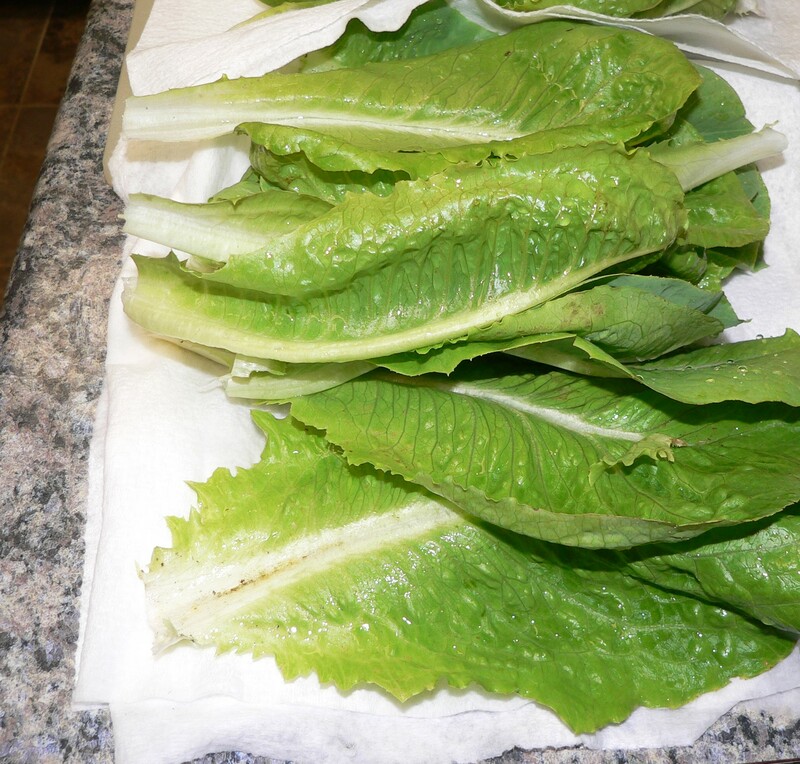 I could go ahead and start cutting the outer lettuce leaves for our dinner salads, but the plants are looking so pretty I want to give them more time before I start harvesting. I’m thinking about starting some radish seeds, too. It FINALLY quit raining today, so I’ve been out there and back again several times. It was 90 degrees in there this morning, so I’ve propped open the door, hooked up the electricity so the exhaust fan turns on automatically, and turned on the 2nd fan. On the left side of this picture, are new tomato suckers I planted today. 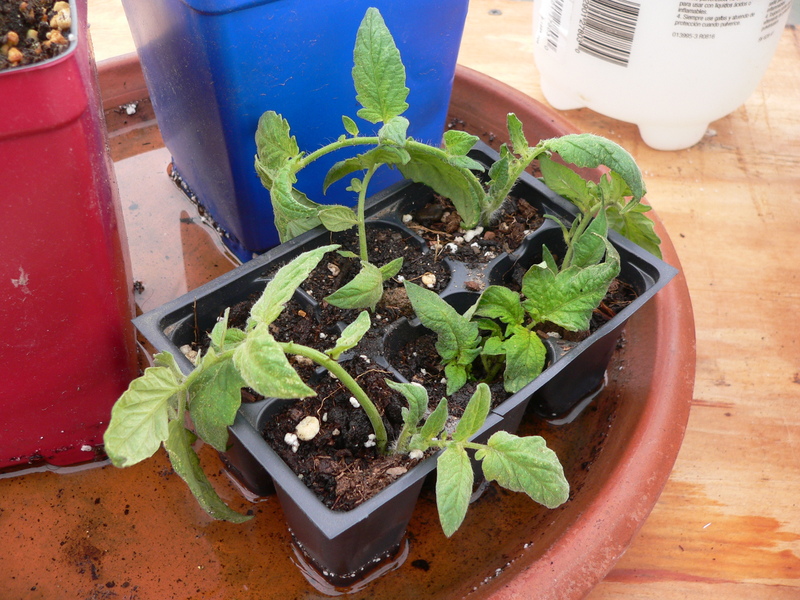 A couple of them were large, so they’re in the larger pots. 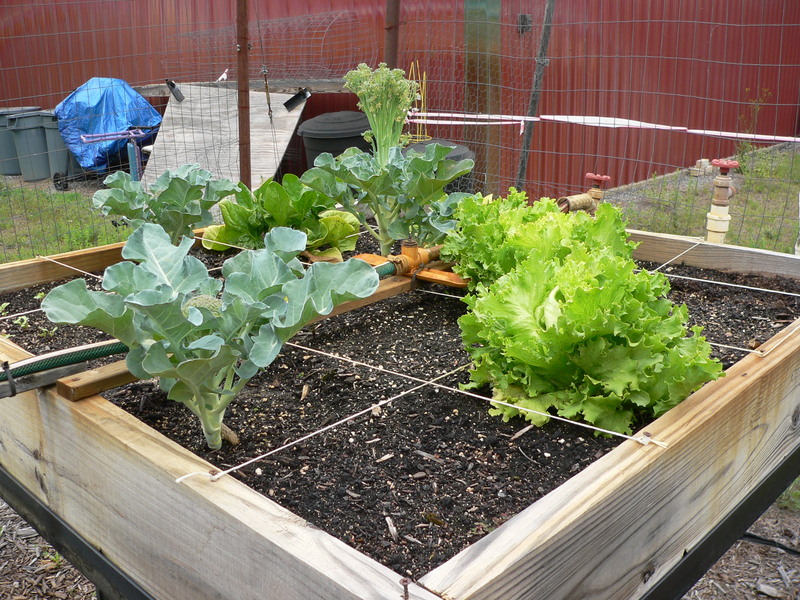 To the right you can see the two smaller lettuce plants I planted a couple of weeks ago. They’re not thriving, but they are still alive. In front of them are more tomato suckers I started today. 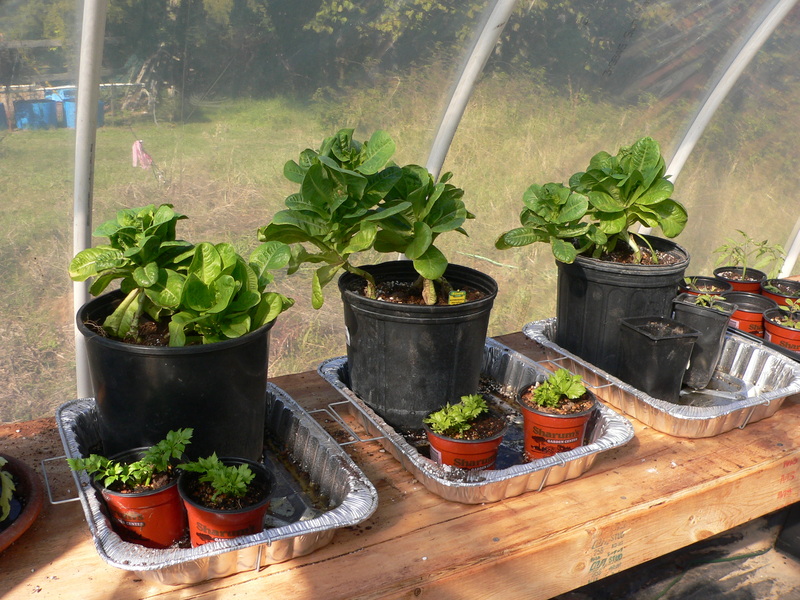 I moved the six leggy lettuce plants into much larger pots to give them room to spread out. They’re looking really healthy. 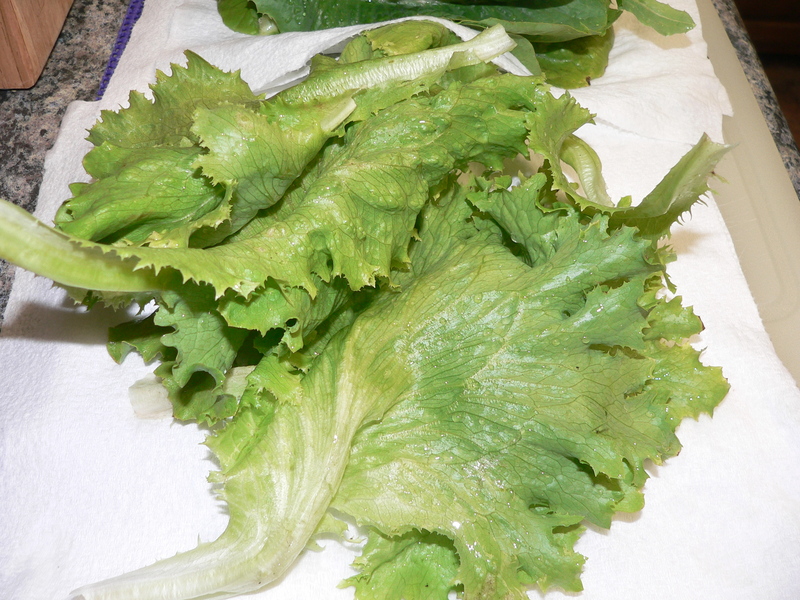 I’ll start cutting outer leaves from each of the plants for dinner salads soon. In front of the two big pots on the left, You can see the celery plants I started in the house from cuttings from celery I bought at the store. In front of the pot on the right are more tomato sucker plants. I just read about tomato plants in my greenhouse book. 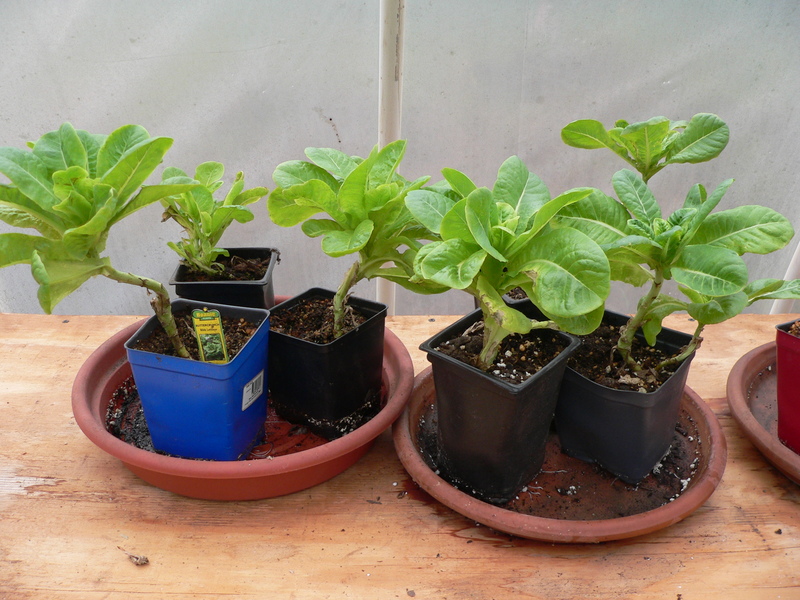 He suggests they need a LOT of air circulation around each plant, so I think I’ll go back out and move them from the 4 and six-pack planters to each in a 3-4″ pot to give them the best chance possible. I’m like a kid at Christmas with the lettuce plants. I can’t wait to be able to bring leaves in and bite them! I found these suckers on a tomato plant and replanted them in the greenhouse. 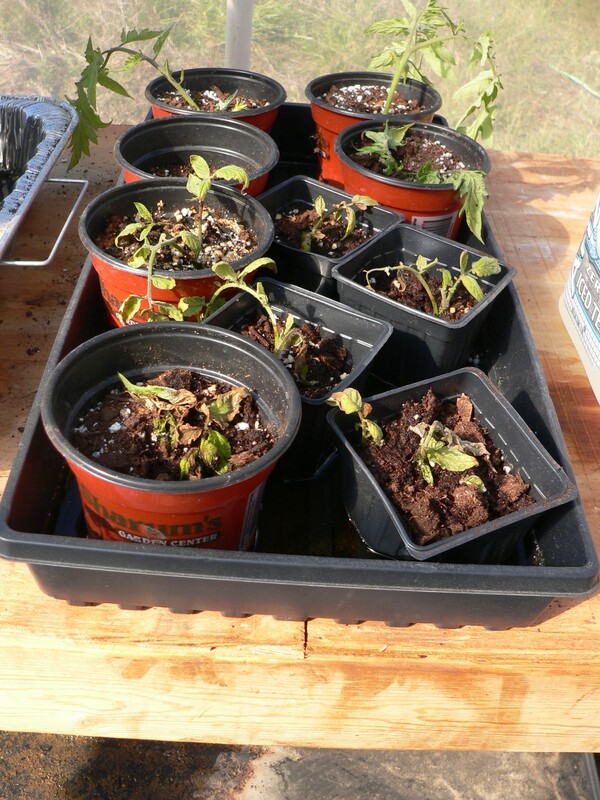 I’ll be trying to get lots of others started, as it’s too cool outside now for the tomato plants to create ripe tomatoes. I’m HOPING that I can either have tomato plants ready to replant in the planters in the spring, or even have a ripe tomato or two to enjoy! So far, these seem to be doing well. Yesterday I turned off the second fan and closed the greenhouse door. The exhaust fan is still hooked up and will turn on if the temp gets over 80 degrees in there. 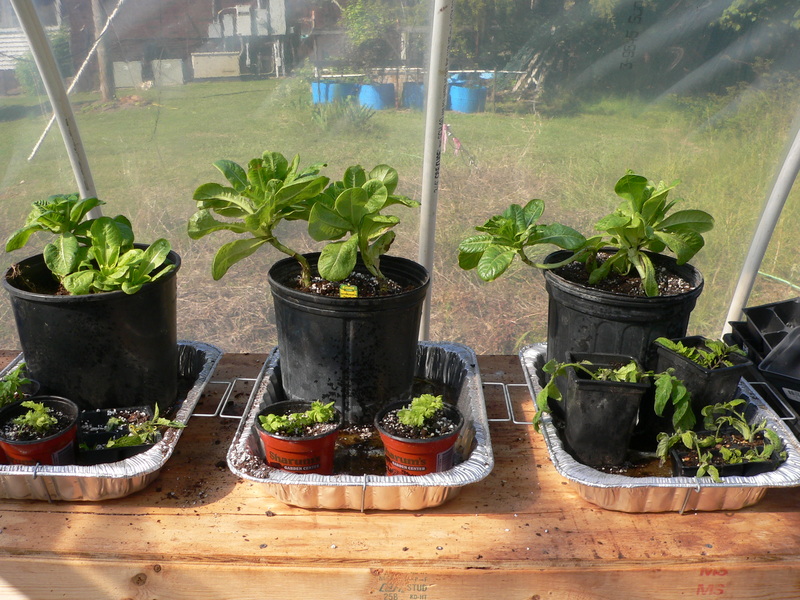 These are the really small lettuce plants I planted about a week ago. They’re still alive, but aren’t having an explosive growth. 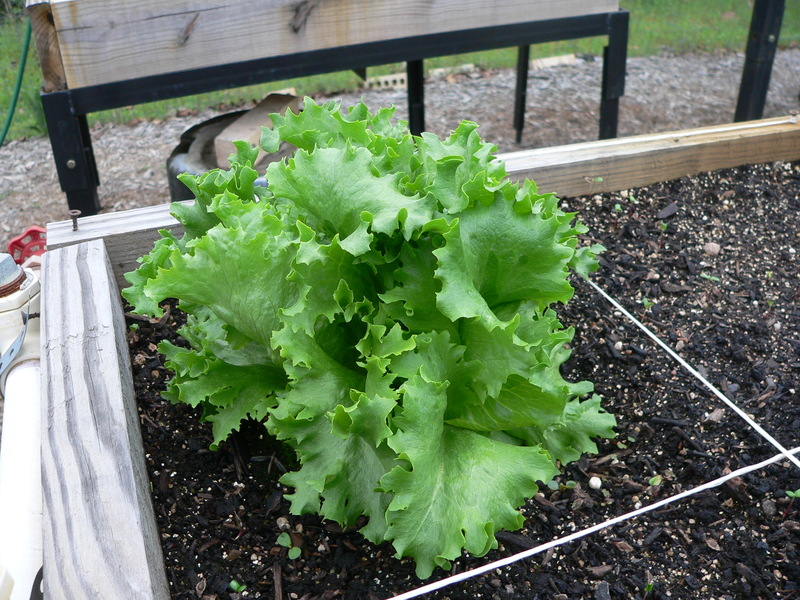 I took TWO shots of the ‘leggy lettuce’ I planted several days after the small ones. Here you can see how large they are compared to the smaller one on the right. 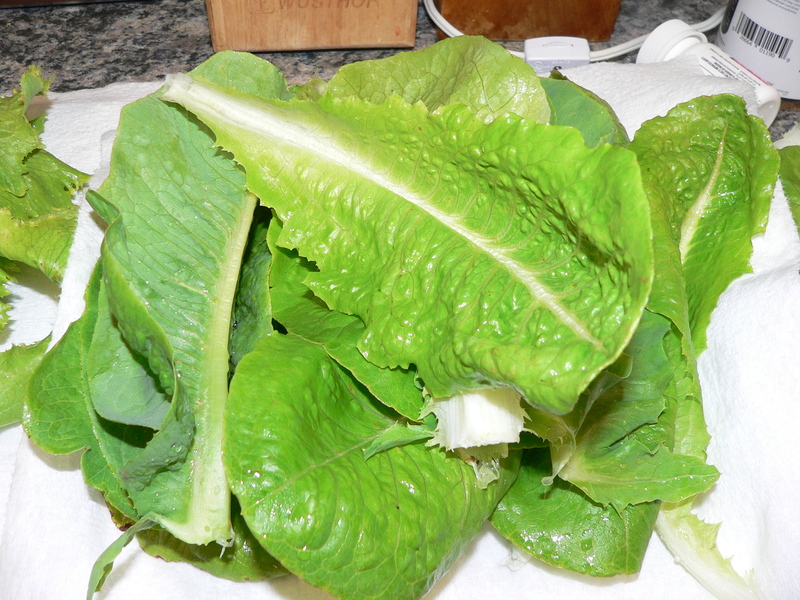 If they continue to do this well, I’ll start carefully cutting larger leaves to include in our dinner salads! We’ve gone from having to wear a sweat band while working outside to having to wear a light jacket or sweatshirt outside in the space of a day or two. I have to tell you, I’ve been more than ready and am embracing the change. It DOES take a bit of switching of gears, though, and I’ll start that today. 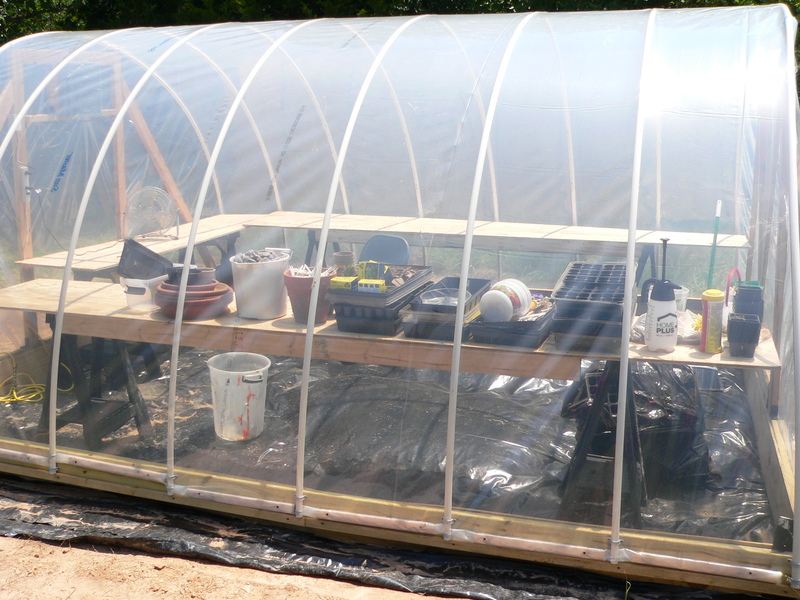 I’ve been running the exhaust fan and a second fan in my greenhouse, plus propping the door open to keep the plants I’ve started from boiling in their pots. I haven’t been out there to check on things this morning, but, depending on what the thermometer in there says, I’ll probably shut off the second fan and shut the door. I’ll also accelerate trying to find tomato suckers to plant – if it’ll stop raining long enough. I want to start a BUNCH, since I’m new to this and tend to make lots of mistakes. 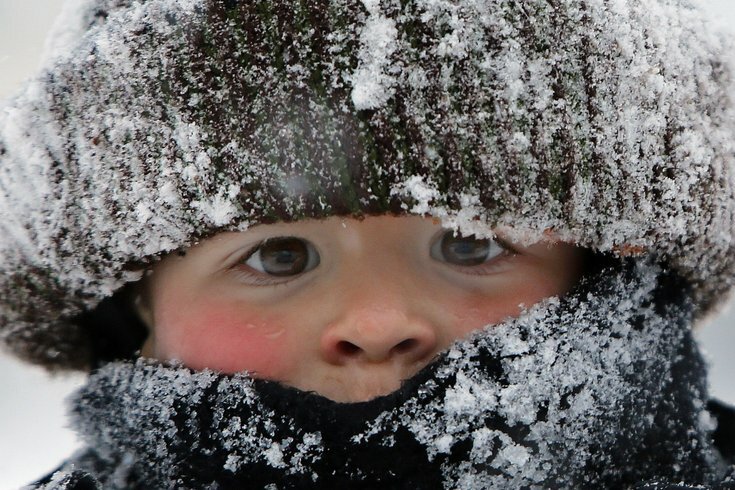 We haven’t started our get-ready-for-winter list around here, since we were sweating and using the a/c only a couple of days ago, so I’ll watch for forecasts and decide if we need to accelerate THAT, as well. My spirits are soaring. I get a lot more energetic when the weather is cool. I’m raring to go! We ordered and paid at the front counter, got our drinks and found a table. 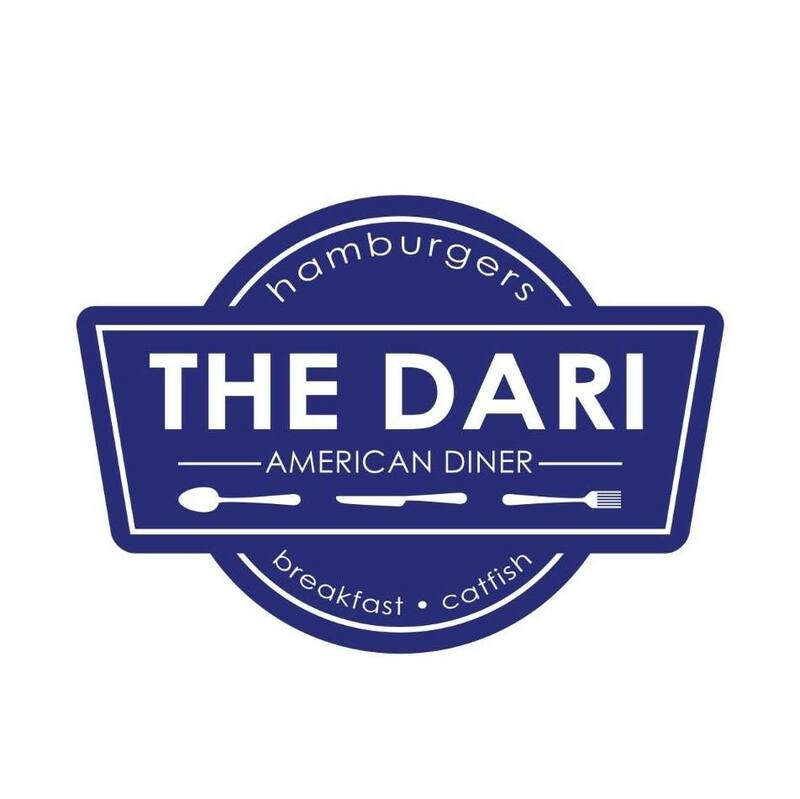 My husband and I ordered a hamburger steak combo, which included mashed potatoes, your choice of sides (we had green beans), and your choice of Texas Toast or a roll. (We got Texas toast.) Our friend chose a grilled chicken salad without eggs. We got our orders quickly, much to our surprise. And both things were GOOD! The chef/cook cooked our hamburger steak to perfection. It had a brown gravy with onions in it. Beside that was mashed potatoes, also with onions, that made a nice combination. The green beans were like home grown and home cooked, with the beans flat and cooked with bacon. Our friend enjoyed her salad, saying it was delicious. We don’t usually go to breakfast, but do when we have to go for blood tests – so we’ll try it for breakfast in November. Our ‘lunch’ was a heavy meal for us, so we’ll modify our eating the rest of the day to work it into our Nutrisystem eating plan, but we were very happy with our experience and plan to go back. 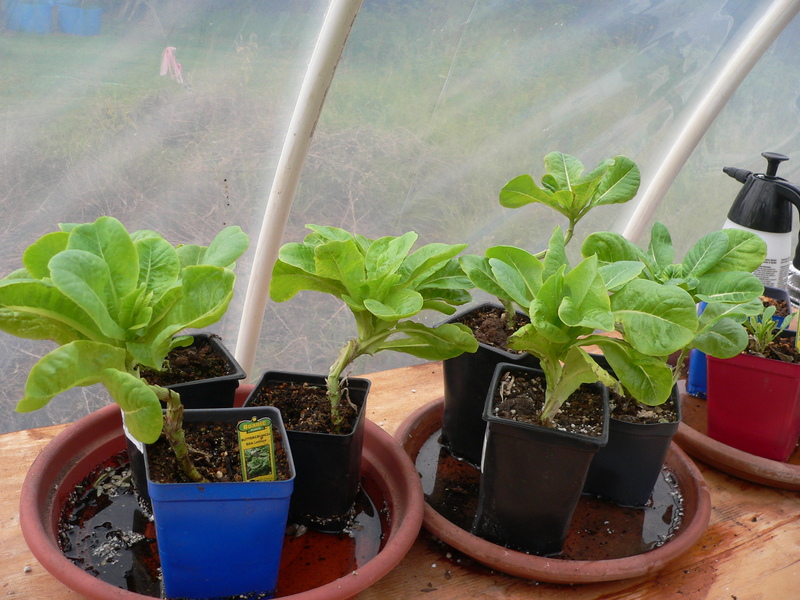 I told you I planted 5 iceberg head lettuce plants recently. Three of them are still alive. 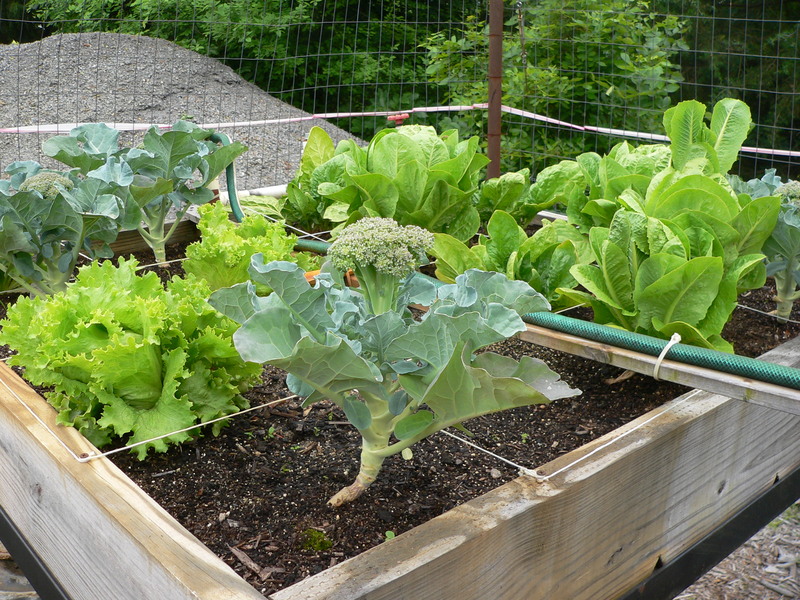 They’re really small, but they’re better than NO lettuce plants. 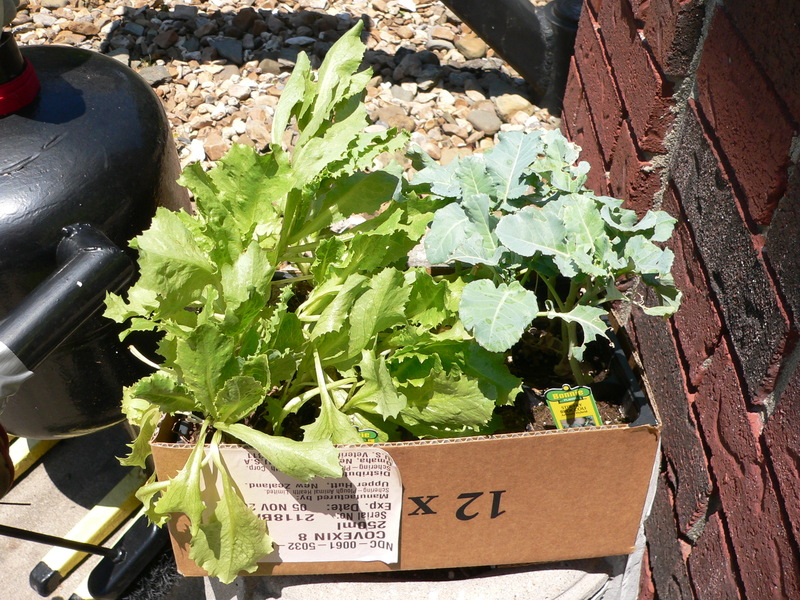 Today I found a six-pack of some really leggy iceberg lettuce plants and snapped them up. I just came in from planting them in the greenhouse. I still have everything open out there, with the exhaust fan coming on when it gets too hot and a 2nd fan on all the time. 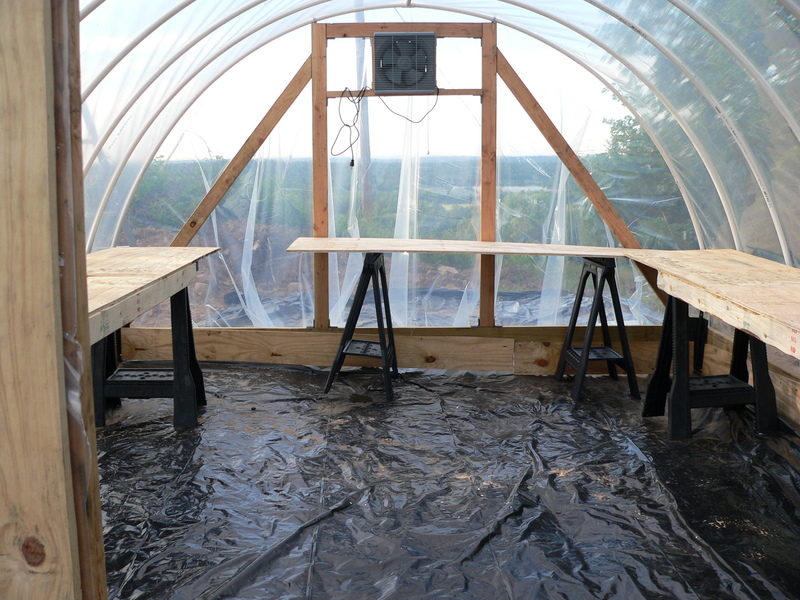 The door on the opposite end of the greenhouse is propped open with a metal chair. The thermometer said between 95 and 100 degrees when I planted the lettuce. I’m not sure if the sweet plants will live with it that hot out there, but the evenings are cool and some cooler weather is on the way. Tomorrow, if it isn’t raining, I’ll try to find suckers on my tomato plants and get them started in the greenhouse too. This is a grand ‘fall’ experiment. 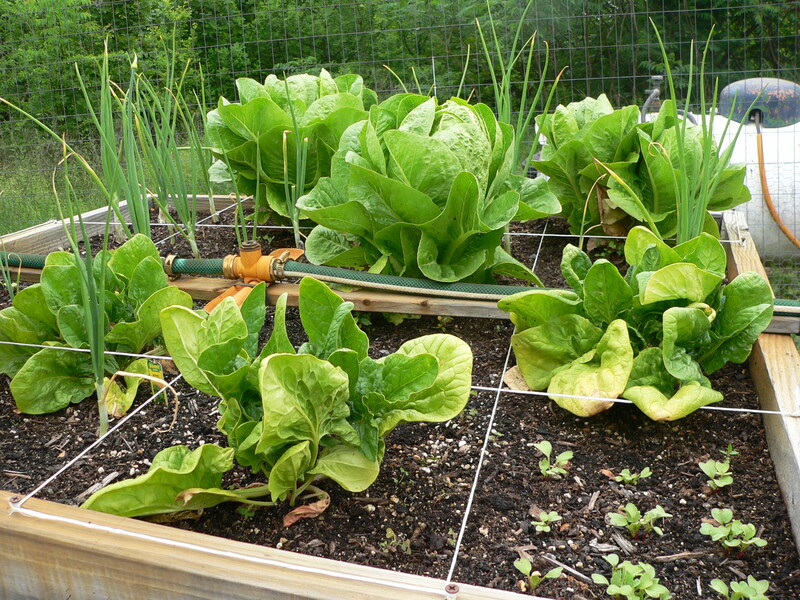 I would really love to have lettuce and tomatoes until it freezes really hard here. That MIGHT be as late as February, if we’re lucky. 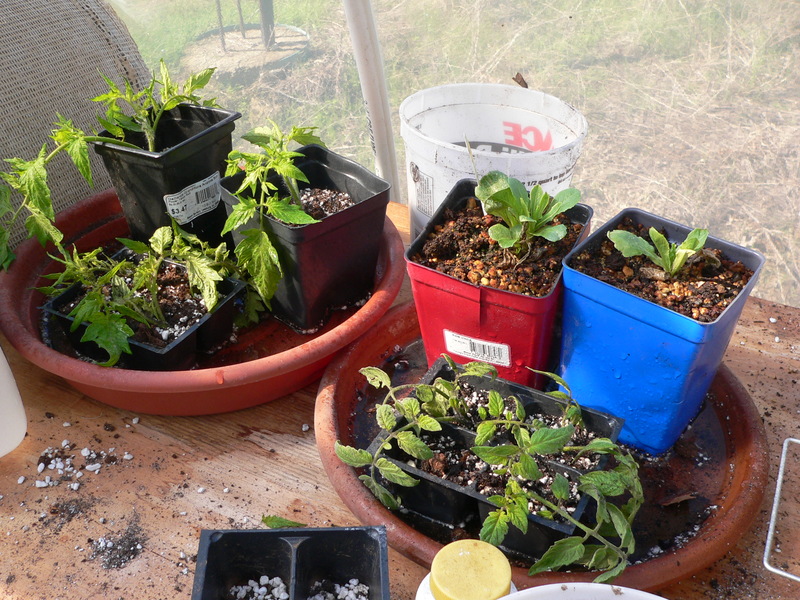 Then around the first of March, I’ll start some plants for the spring garden! 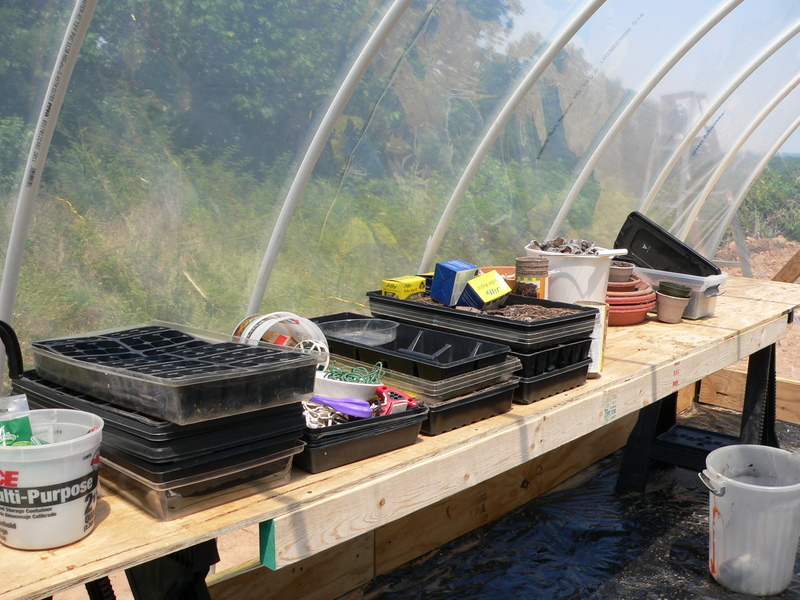 I’m reading everything I can find on how to start and grow plants in my greenhouse. 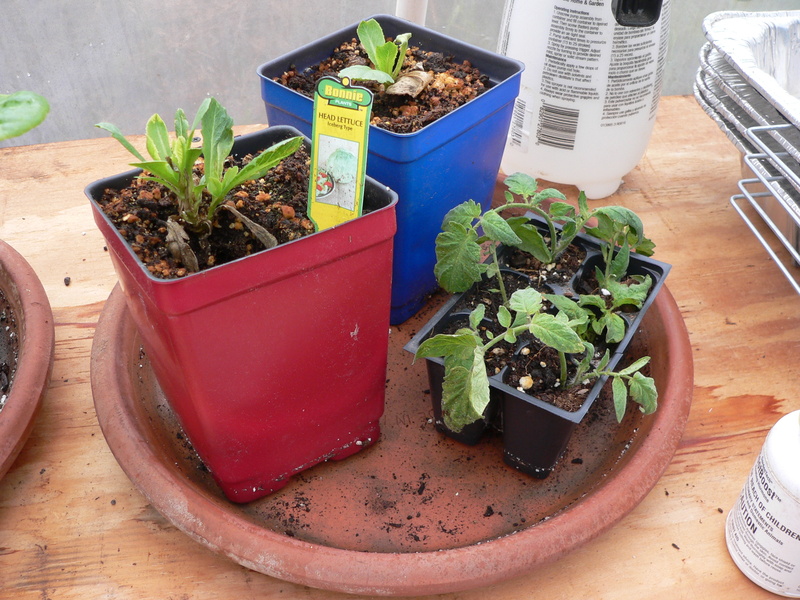 Frustratingly, most are written for people who are trying to keep their plants WARM, rather than having them boil to death, as mine have. I’ll keep reading, because I would really like to extend our growing seasons as long as possible. When I get the tomato sucker plants going, I’ll try to get some pics for you. I told you yesterday that a scorpion casually waltzed up from the drain hole in the sink and mooned me night before last while I was sleepily washing my face getting ready for bed. I won’t have it! 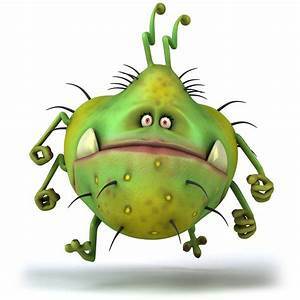 Today I’m concentrating on the second floor, getting stuff up off the floor, vacuuming thoroughly, and then spraying all around the baseboards, windows and doorways with our good bug sprayer. One of the bug companies years ago said, “The only good bug is a dead bug.” I basically agree – emotionally – since I know that bugs are good for something in our ecology. I just don’t want them to be good for the ecology in my house! We’re in the awkward stage for the commercial bug sprayers to come back here. They spray, and for two weeks afterwards, if you see a live bug, you call and they’ll come back and spray again at no extra charge. We’re about halfway between the no charge respray and them coming again for the contracted quarterly treatment. I’m trying not to have to pay an extra charge, if I can knock these out myself in-between. So far, I’ve finished our master bedroom and the master bath, plus our two closets. I’ll rest a bit and then go up and tackle the next section. Hopefully, I’ll finish the second floor before the end of the day. I hope it’s not buggy where you are. 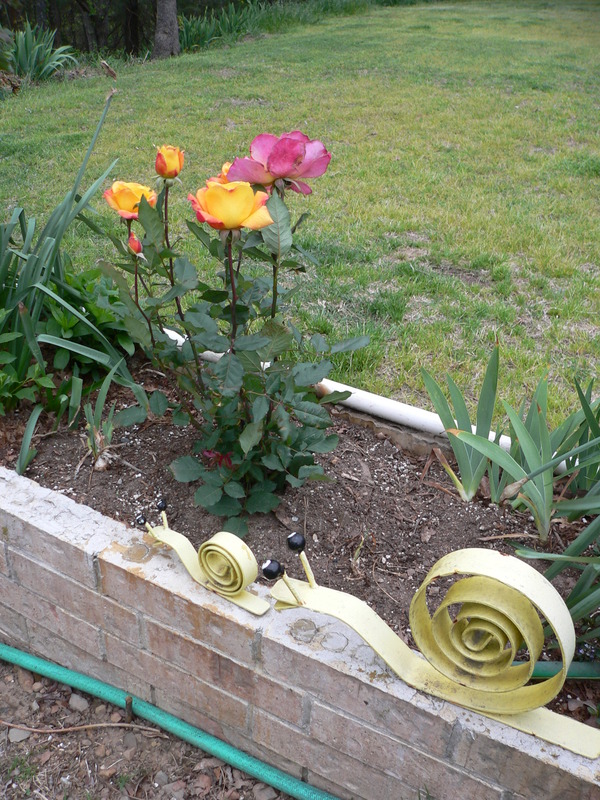 I just came in gasping and weaving, from getting the garden cleaned up – making a check to make sure I harvested all the onions yesterday – pulling off the demarking strings (most of them snapped the minute I touched them) and re-spraying the bug killer in the boxes again. The last step will be when I can get my breath back and my temperature down below ‘WAAAAAY – too – hot.’ I’m going to mix up weed killer and spray it on the floor of the garden, and all around. At another time I’ll do the weed eating of what I hope will be dead weeds around everything and then I’ll be ready for fall, hoping that we don’t go directly from lethally hot summer into way-too-cold fall. We have GOOD air conditioning in our home and in our vehicles, so we can insulate ourselves from it, unless we’re determined to get yard work done. I’m counting the sessions working in the garden as most of my exercise for the day. Once I’m finished with that, I’ll do my yoga and then head for the showers. 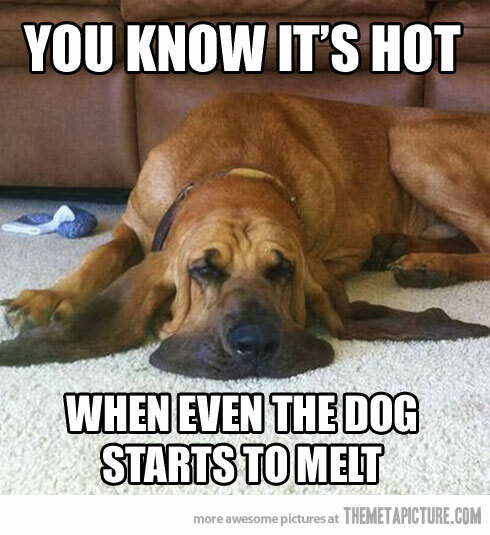 I hope that if it’s hot where you are, you have somewhere to go to give you some relief. The heat index is 105 degrees right now. Not fit for man nor beast. Thankfully, my husband mowed the yard last night right before dark, so the Lewises are lookin’ pretty good (for the Lewises). One of the many reasons we don’t live in the city limits is that we didn’t care for trimming our lawn to a required height and in the proper frequency, agonizing over brown spots, moles, voles, or other ‘ole’s, etc. We usually mow once a week, weather permitting, and my husband is delighted when we get to the stage in the summer where we aren’t getting any rain to keep the grass growing before our eyes. “Brown and crunchy’ is his favorite grass. I never got back outside yesterday after gathering tomatoes and getting into the hostile ant pile. My ankle is FINALLY only a bit puffy today. The swelling is such that you can actually SEE the bites/stings rather than my ankle being one pink puffy area all the way around. I’m planning to try to get the garden cleared tonight, but I’ll mix up more EIGHT to spray all the plants, all the raised bed planters, and the ground around them before I try to start clearing things out right before dark this evening. I’m going to pull out all the plants, including the onions. I’ll put the onions on a screen we have on the side of a trailer so that they can start drying. They’ll need to do that for several days and then I can store them in mesh bags in the pantry. I’m hoping we got a good crop this year. 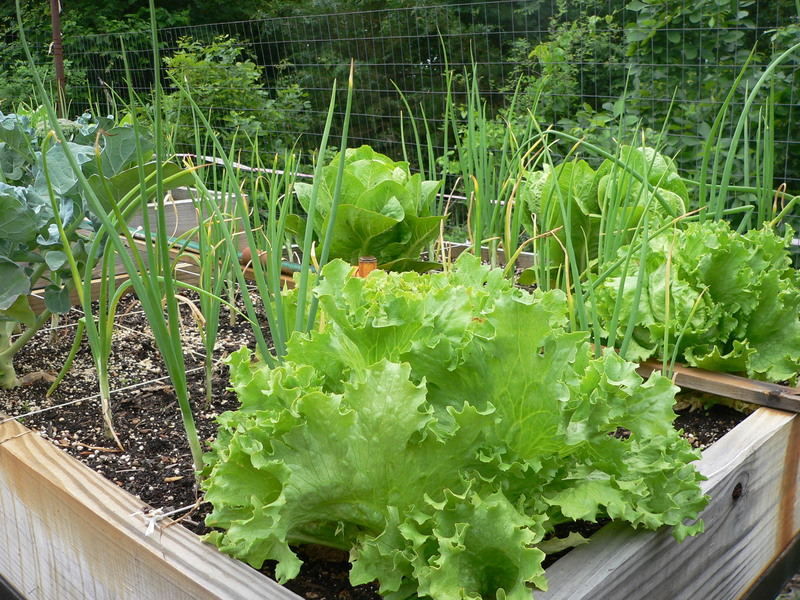 Last year we had home-grown sweet onions throughout the winter and into the start of April! If you’re having similar weather, don’t forget to take frequent breaks and drink lots and lots of water. This morning about 1:30 a.m. we had flickering power and a new thunderstorm. I stayed awake long enough to make a trip to the bathroom and then turn on our fan again before sleeping through the rest of it. It was raining (still – again?) when we got up and had breakfast. Both doggies have been out and are back in – TWICE – both wet and happy from playing out in it. The cats are staying firmly in their cube beds on top of the woodpile in the garage, shaking their paws at even the THOUGHT of getting wet. The fish in the aquarium are unimpressed and bewildered by all the hubbub. 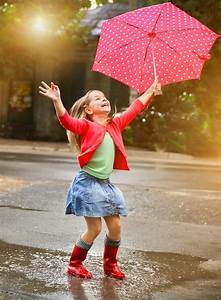 We usually shop for groceries on Sunday mornings, but we’ll hold off, not wanting our groceries to get any more wet than necessary. I’ve been on the front and back porches, though, a couple of times, enjoying the cool and the wet, the rumbling of the thunder, the blowing of branches, and the glorious smell of the rain. Once this is over, we’re back into the oven that is Arkansas this year, so I’m soaking up all I can get. I came in dripping twice, and then called it a day. I’ll try to do more tomorrow. 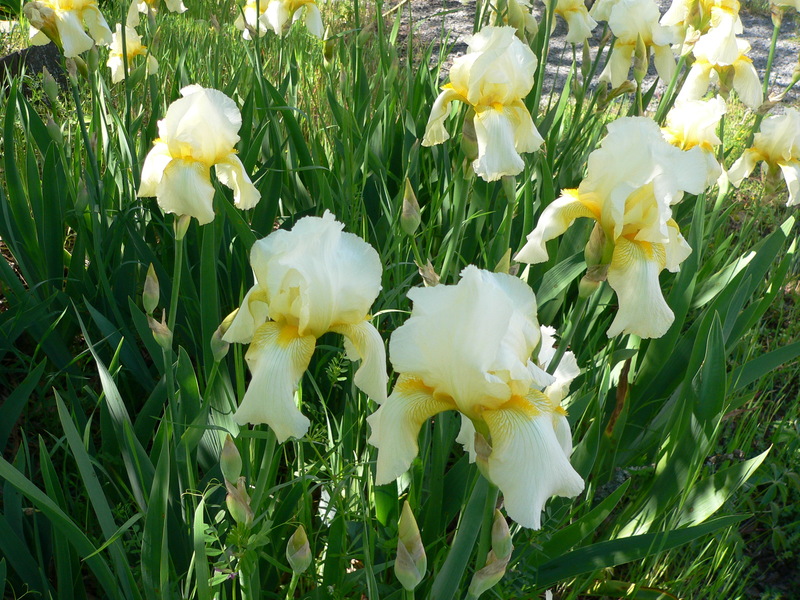 I wanted to share some nice flowers that are blooming now, though. 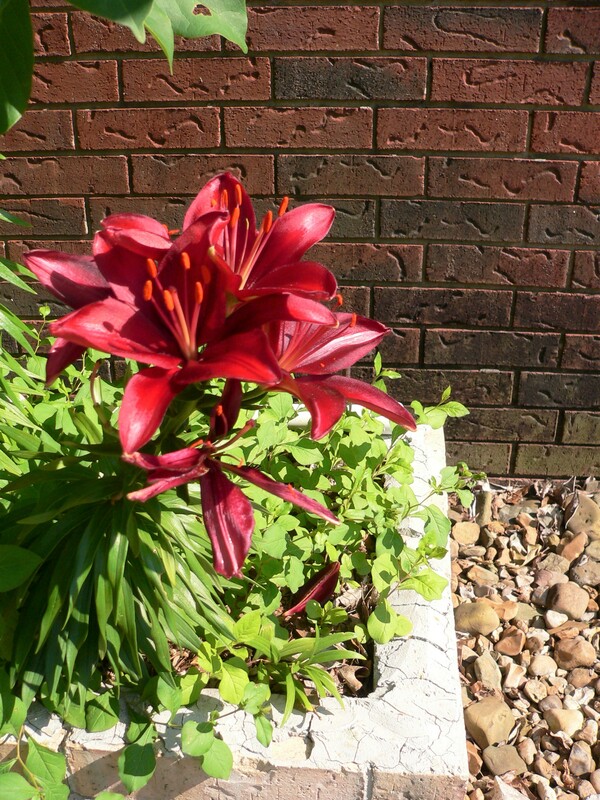 This is a burgundy lily. 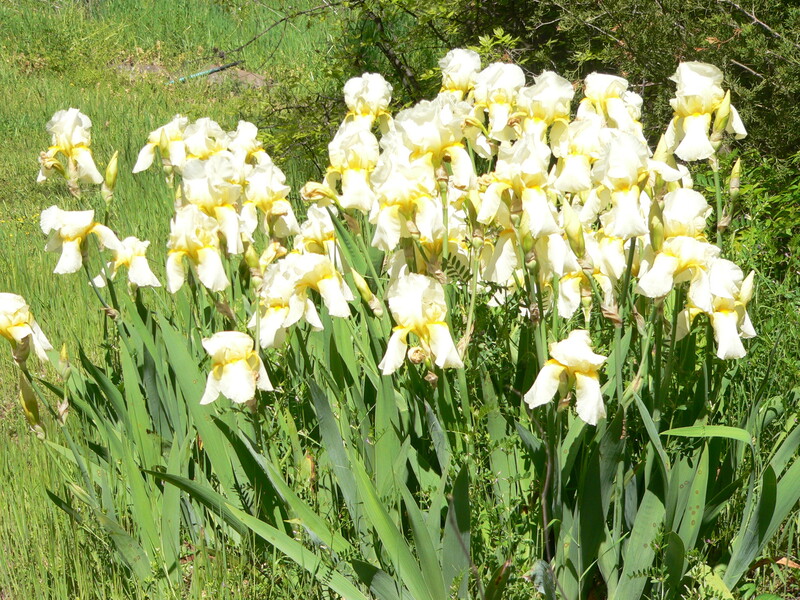 It’s all one bloom and knocks our socks off each year when it blooms. 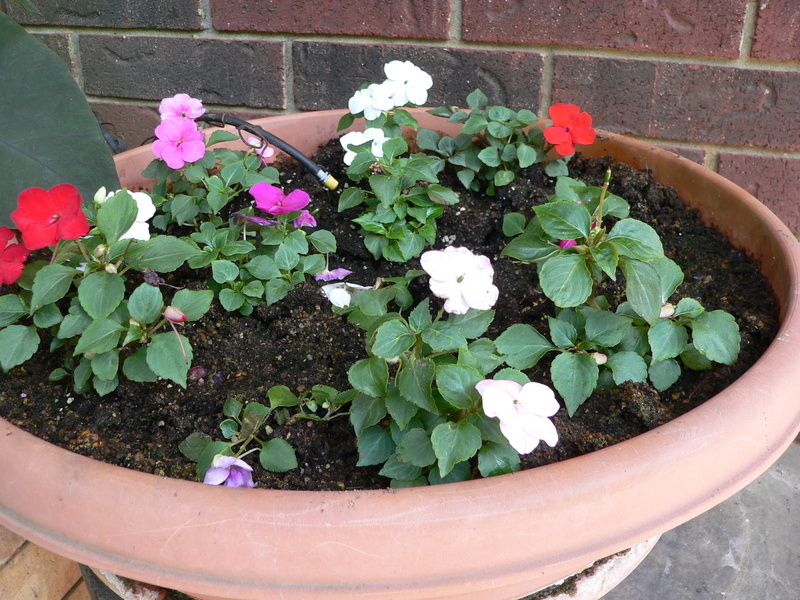 This is impatiens on the front porch. Our wind and rain yesterday evening was impressive – hard rain and gusty winds. My husband waited out the storm in the shop. Our electricity flickered twice, but came on again quickly enough that our generator wasn’t triggered. When the rain finally let up, my husband used the opportunity to burn all the trash that had been piling up in the shop, able to finally burn it safely. When we drove down the driveway to go to town this morning, our robot beside the driveway (over 6 feet tall, weighing 250 pounds) was leaning into the trees. When this happened the last time, he went completely off the driveway and was head down halfway down the slope of the yard. We had to use a winch and my husband’s smarts to laboriously get him into position again. At that time, we arranged for a SECOND length of chain to be attached to his neck. The original went around his neck and was around the iron gateway post you see behind him. The second one is around his neck and goes around the tree down the driveway in front of him. The two together kept him mostly upright, just leaning into the trees. We were able to easily bring him to an upright position again. It’s an impressive wind, though, that blows him over! No other consequences from the storm, thank goodness. Everything got a really good amount of water. 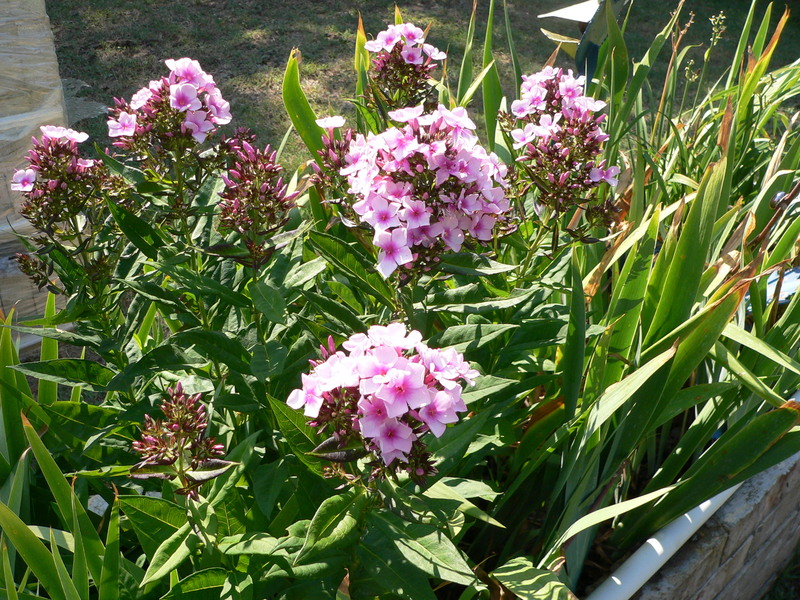 All the plants are saying, “Ahhhh!” as we walk around the yard. 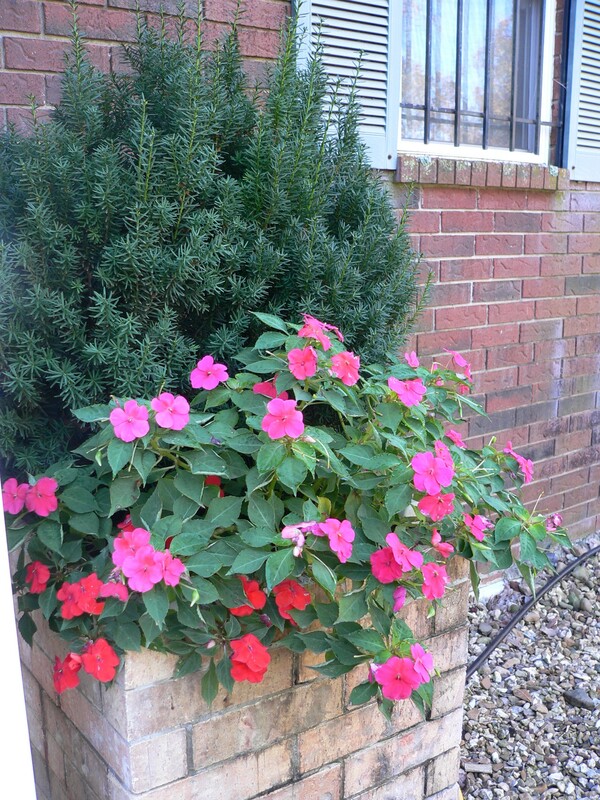 Since it’s still a bit cooler, I’m going to use the opportunity to try to get our trio of brick flower planters that run between our front yard and our driveway under better control. I’m hoping not to get bitten and/or stung, having sprayed everything with a good bug spray last week called, “EIGHT,” that’s supposed to kill the bugs, but not harm the plants, our animals, or us. 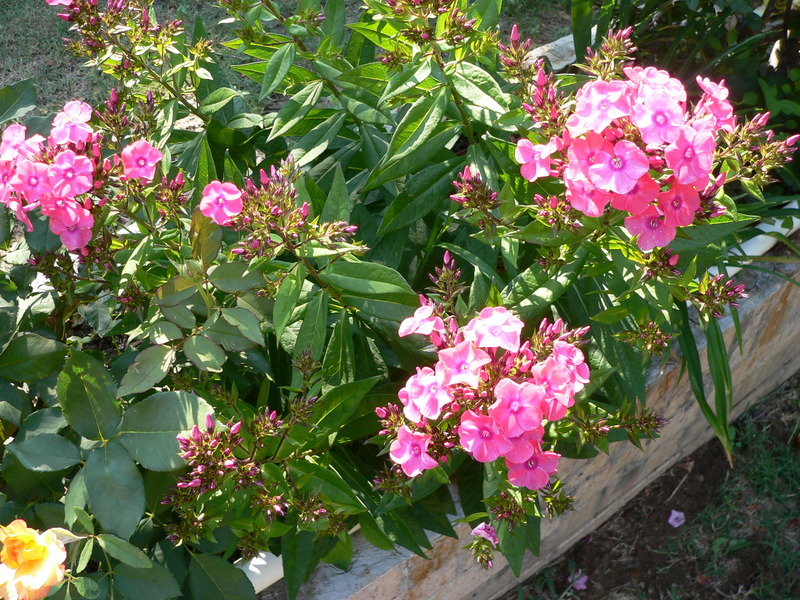 My husband and I bought two kinds of salvia, 3 six-packs of impatiens, 2 mandevilla, and 15 small pots of wave petunias at the nursery yesterday. 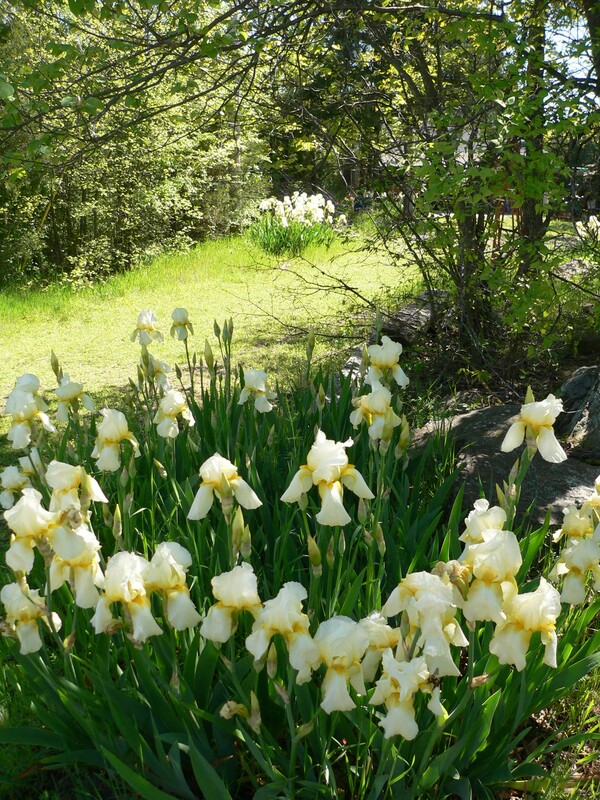 Since our weather has been wonky – with a cooler than normal spring followed by hotter than normal summer temperatures – it’s been all I could do to try to keep up with our vegetable garden, our flower planters, and the yard. Then I cleaned out Amber’s kiddie pool. I scrubbed it with the car broom, drained it a bit more than halfway, scrubbed it again, and then dumped out the rest of the water. My husband suggested that we put it on the east side of the house where it gets a bit more shade so the water would stay cooler. I got it into a reasonable spot, sprayed it out again, and then started to fill it. Amber came running around the side of the house, jumped into the filling pool, laid down in it, drank some of the water, then jumped out into the dirt, now made into mud by her dripping body. She loved it. She ran all around like a mad thing, started digging in the dirt, and then, of course, jumped into the pool with the muddy paws. She laid down again, smiled at me, bit at the sprayer hose, jumped out…. You get the picture. The water isn’t pristine, but it’s much better than it was, the pool has been moved to a better spot now, and the dog is ecstatic. Mission accomplished. I then used another hose to clean up the deck where I had made a mess planting. 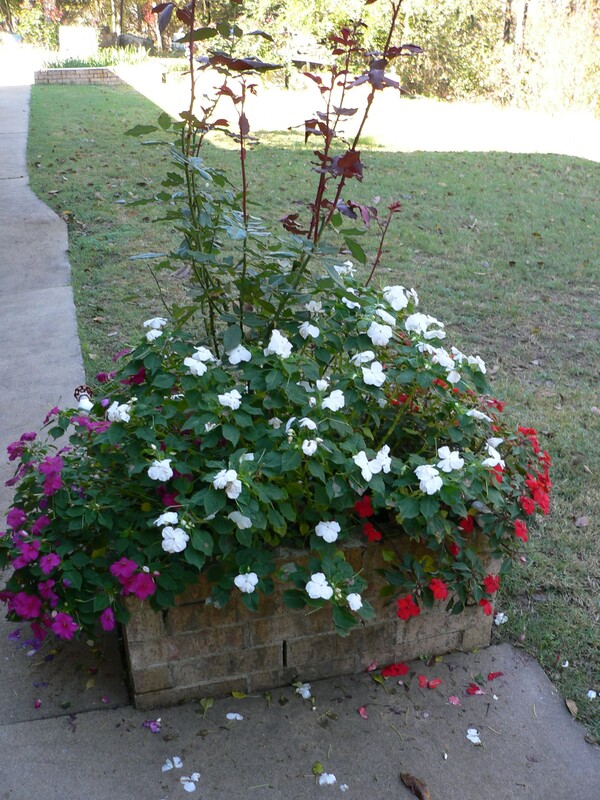 I used the “less is more” philosophy this time, emptying 4 big pots I usually fill with flowers. We have really nice, bright burgundy wave petunias and mandevillas on the deck now – making a nice spot to sit outside – assuming this abnormally hot weather tames down for a bit before we officially get into the too-hot-to-sit-outside part of the summer. 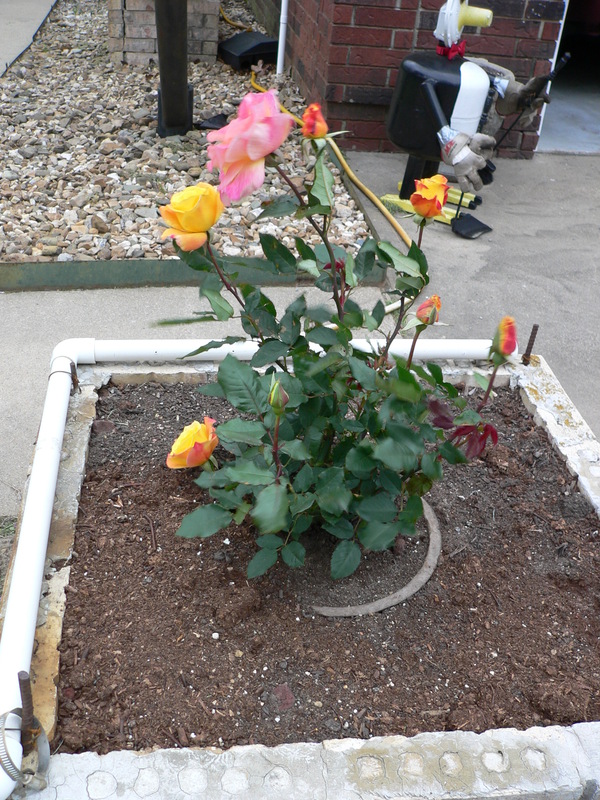 I took time while the pool was filling to move the nice Joseph’s Coat climbing rose-bush my friend Kay gave me for my birthday in March to a sunnier spot where I think it will be happier. That’s it for the day on working outside, until this evening before the sun goes down, when I plan to mix up batches of ‘ant-to-elephant’ bug spray that I can use on my veggie garden. I plan to hose everything down, use a stronger spray for the ant hill I discovered, wait a day or so, and then see how things are out there. I still have pink areas up and down my arms from the angry ants that bit/stung me for disrupting their ‘homes’ as I pulled up cool weather plants, but the swelling and itching are finally mostly contained, thank goodness. I’ve just come down from taking a long shower and putting on clean clothes. Ahhhh! I hope that you have fun playing in the dirt at your house, too. Today after a nice time at Lunch Bunch, we stopped at the co-op on the off chance that they might have a few plants for our garden. 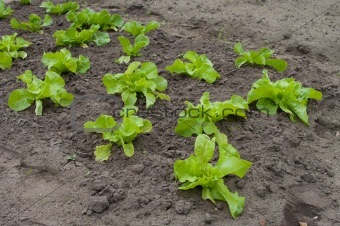 I found a couple of lettucy type plants that I hope will fill in where my romaine is bolting and not long for this world. 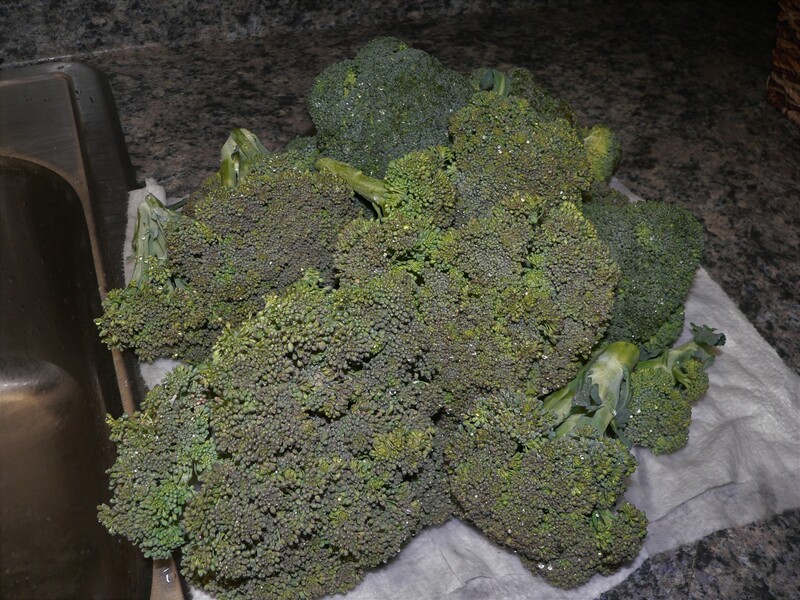 I also found a plant called, “broccoli stir-fry.” Since I’ve harvested the majority of the main part of the broccoli plants and I’m not sure if I’ll get more from any of these, I’m happy that I may have another chance for more broccoli this season. 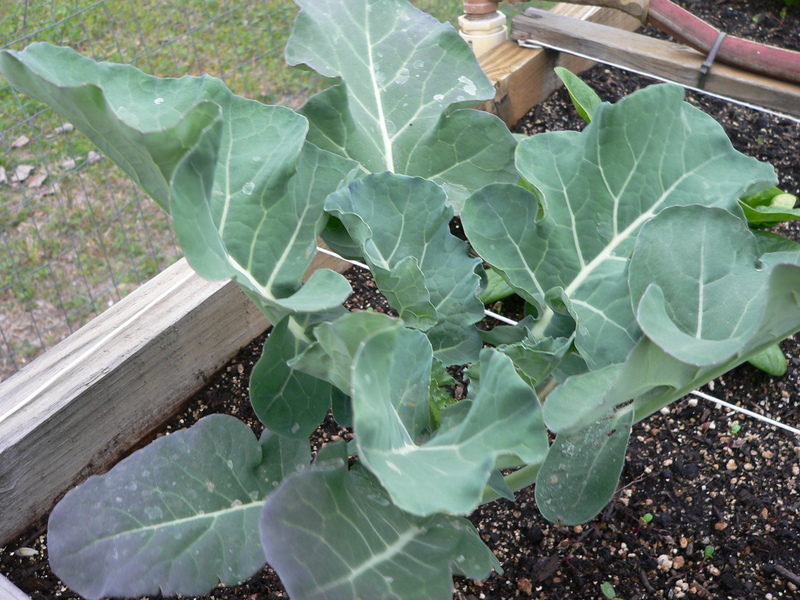 The fact that we’ve gone directly from winter to summer this year is hard on the garden, particularly for the cool-weather plants like broccoli, spinach, and lettuce. It’s WAY too hot right now to be trying to work in the garden, so I’m doing other stuff while waiting for the sun to tone it down a bit. 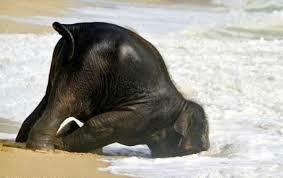 (We’re having a high of around 90 with humidity at 61% right now – way too hot for this old lady.) I’ll try to take some pics to share later. I’m grateful for the harvest yesterday. In the picture above you can see that my spinach plants are not enjoying the heat. 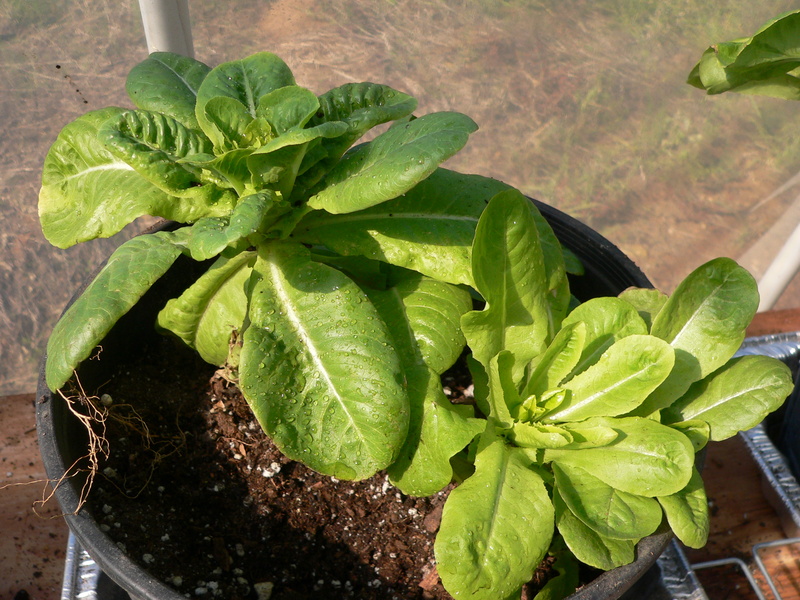 Lettuce and spinach are cool weather plants and I usually enjoy quite a harvest before the too-hot begins. 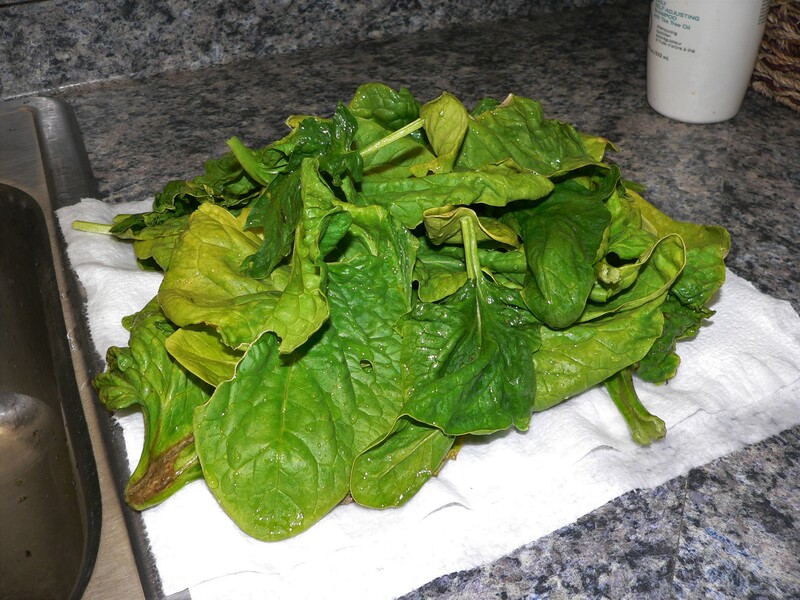 I’ll harvest as much spinach as possible because I can freeze it. 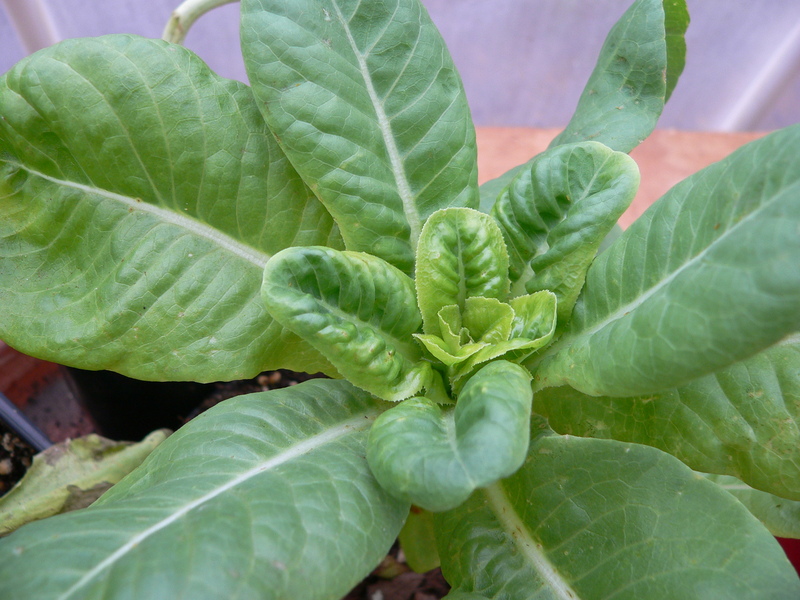 The head lettuce leaves are still okay, but looking a bit stressed. 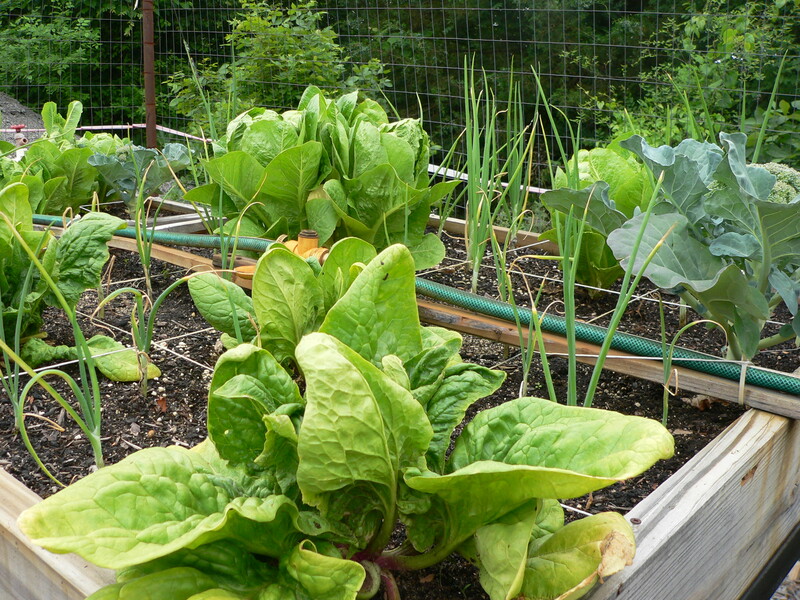 These plants are happier than anything else, with the exception of the radishes, in the square foot garden right now. 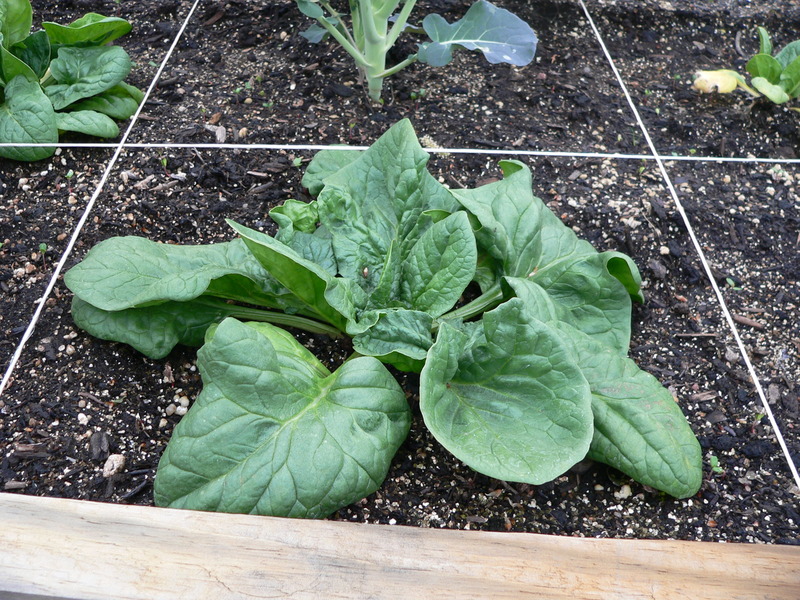 I’m sad because the really hot-too-soon in the season weather we’ve been having is causing the romaine lettuce to bolt. I’m not sure how much more I can harvest before the leaves taste bitter and I have to compost the plants. 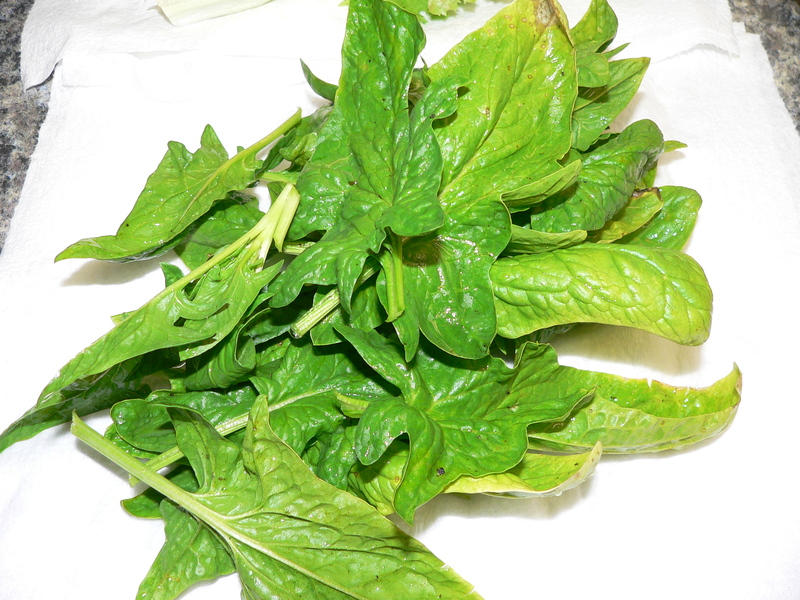 We’ll enjoy the fresh lettuce and spinach for salad each day for as long as possible. 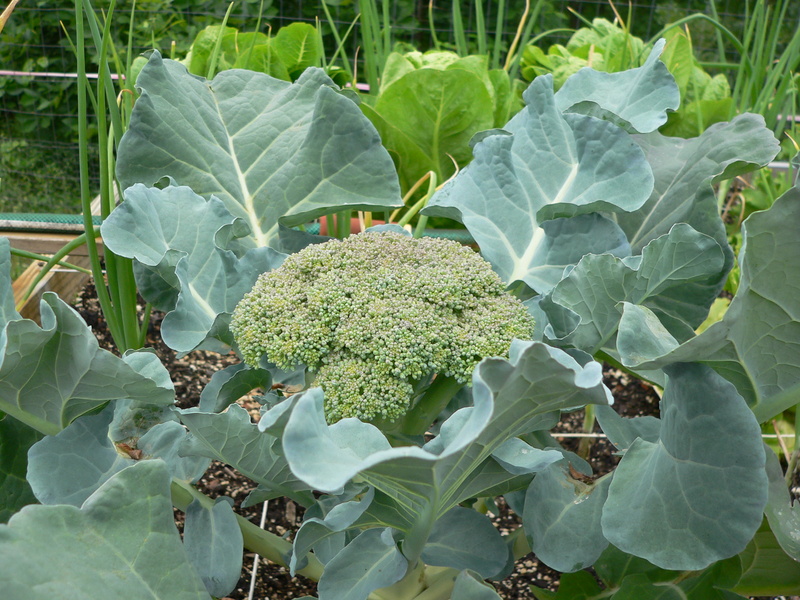 I’m not sure whether I’ll get more broccoli, but the hope is that I’ll get more from the shoots from the main plant after the center has been harvested. The radishes and onions are doing fine, although some of the green tops of the onions are shooting up and trying to make seeds. The tomato plants on the other side of the house are growing rapidly. They like the heat. 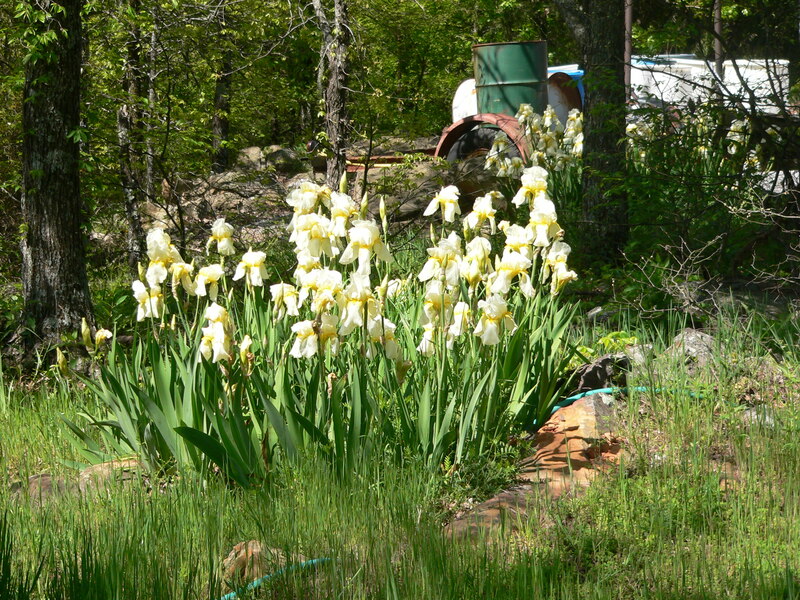 I have a few blossoms, so I’m hopeful we’ll enjoy a nice crop this year. 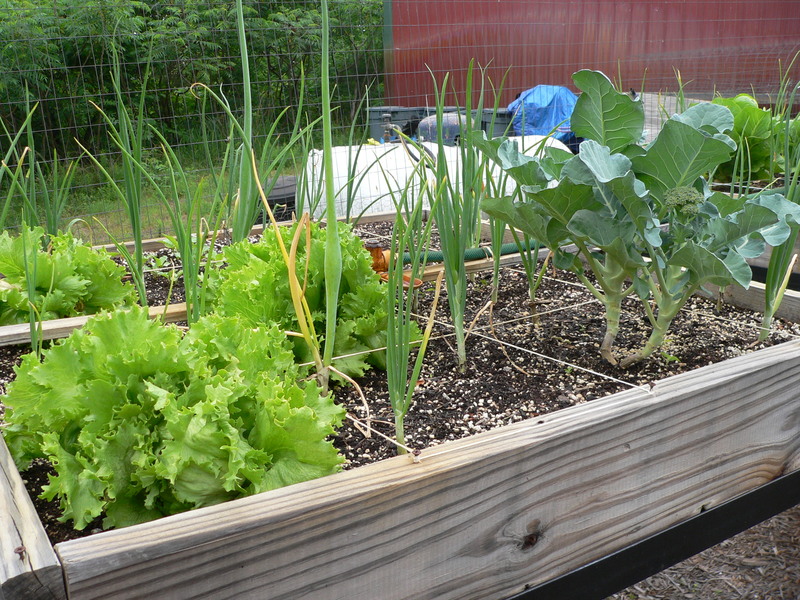 Our raised bed square foot garden is doing well so far this year. We have six 4’x4′ boxes on metal ‘tables’ at about my chest level. I can just walk up to them, planting, weeding, or harvesting without having to get up and down from my knees or bend over double – a thing I can’t tell you how very MUCH I appreciate! 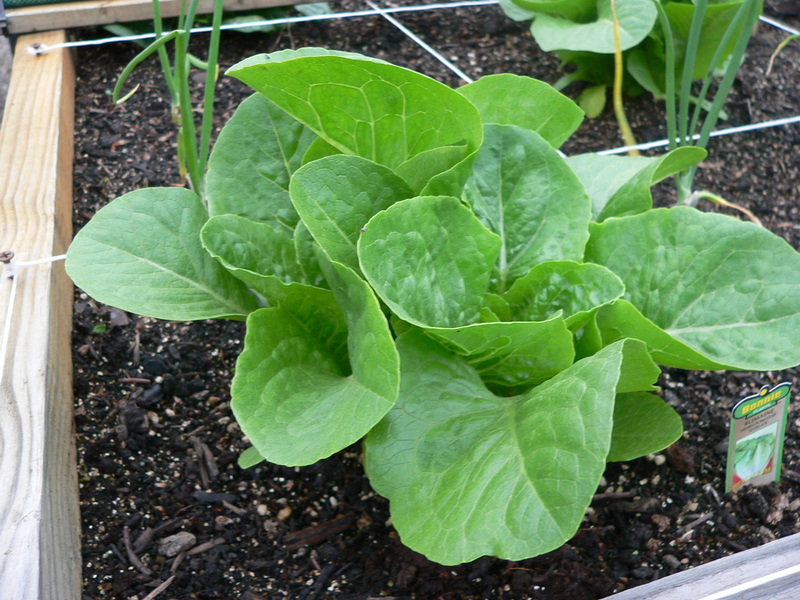 We are growing iceberg head lettuce, romaine lettuce, sweet onions, radishes, spinach and broccoli. We have two converted planters on the east side of the house with tomato plants. I’m going to go out and harvest some things today, but I wanted to show you how nice the plants look before I do. I have some celery started in the kitchen that I’m hoping I can transplant to these empty squares soon. On the lower right, you can see the start of radishes in the square. 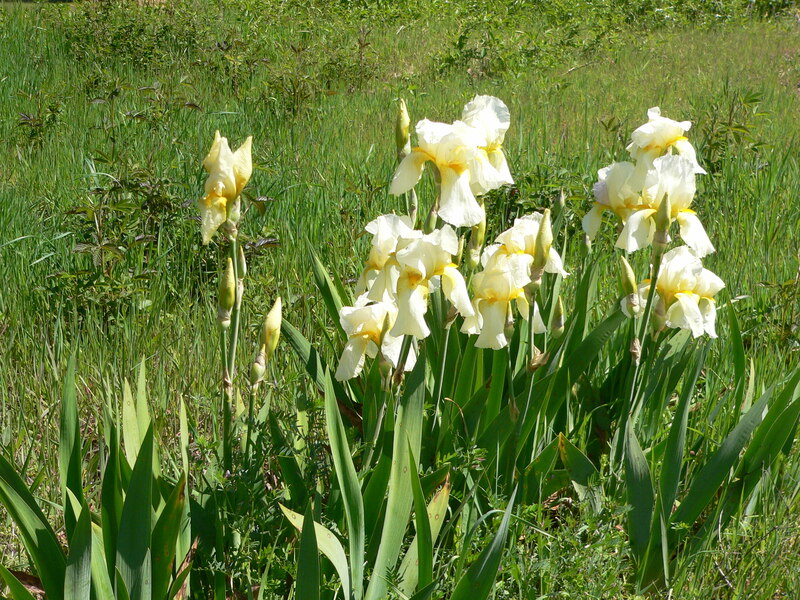 Last fall I cleaned out the planter where the ‘new’ iris were, the ones from Nanna’s Iris Garden in Charleston, AR. 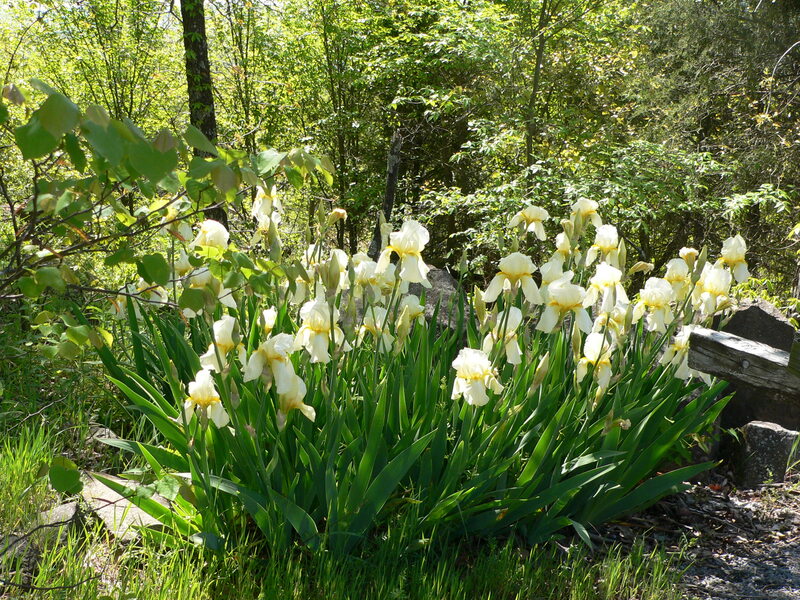 I transplanted iris all over the yard, and still have some that need to be planted. 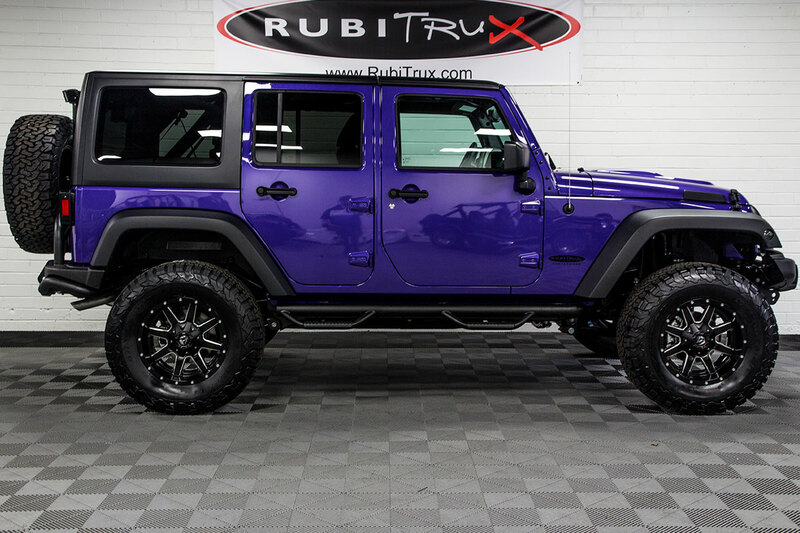 This is one of our new ones and I think it’s really nice. I cut the top bloom and brought it into the house for us to enjoy, leaving the rest to bloom outside. I love this time of year, each time I take a trip around the yard, I find something that fills my heart. 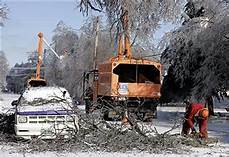 This picture shows some of the equipment being used, but the season is wrong, showing them clearing branches after a bad winter storm. The Arkansas Valley Electric Company guy woke us up this morning, telling us that they were bringing their equipment today to cut branches that were too close to electrical lines. We have seen them on the main arteries of Greenwood over the past few weeks, sawing down countless branches so that we hopefully won’t lose power during spring severe weather due to trees falling on power lines and bringing them down. I just came in from trying to mark all of our guy wires on the ham radio tower, plus electrical lines going low across the area where their equipment is coming up to make sure they see them. My husband brought a PVC pole we use in the garden for them to use to hold up the low hanging lines so the equipment can go under them safely. 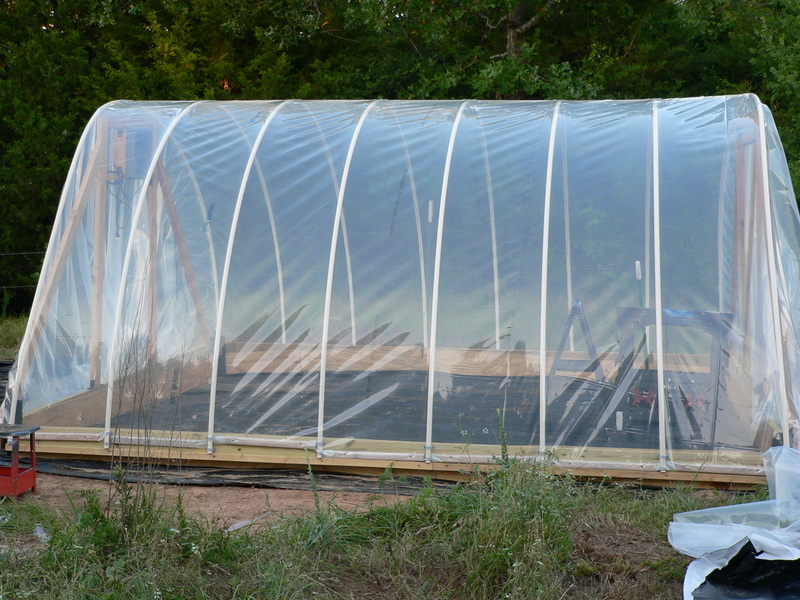 I also unplugged the electrical cord that goes from the house out to the greenhouse so it wouldn’t get run over. They have a regular pickup truck, a big vehicle that has a radial type saw on the end of a long pole that can cut horizontally or vertically, as needed. There is something else that is causing big chips to fly in all directions, so we’re keeping our animals inside until they are finished. The biggest problem area that I can see is our triple evergreen trees that are practically grown together, home to countless birds. The tops of the trees are really encroaching on the power lines. They might have to aggressively attack those to protect their power lines. We are due for severe storms Thursday, so I’m delighted that they are out there now cutting away the stuff that might cause problems. Hummingbird Bird Bath is UP! Last year I saw the prettiest picture on Facebook of a hummingbird bird bath. 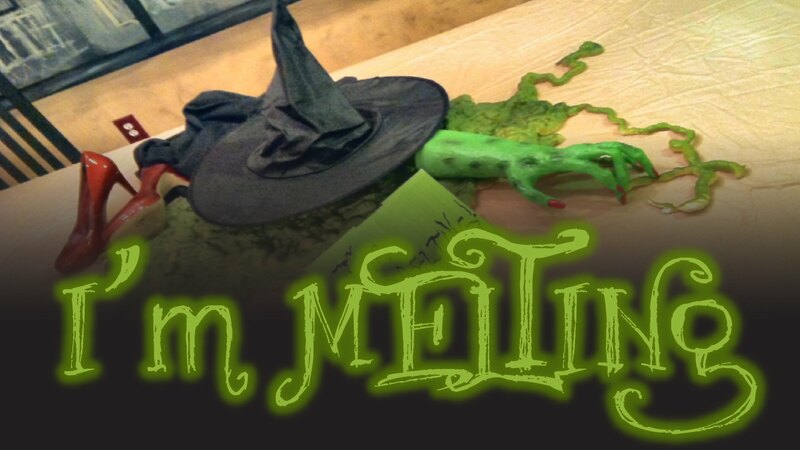 This one is very different from the one we saw, but we enjoyed putting our spin on the idea. This tub has a hole in the center where the water can come in. We have a trashcan under it with a pump. 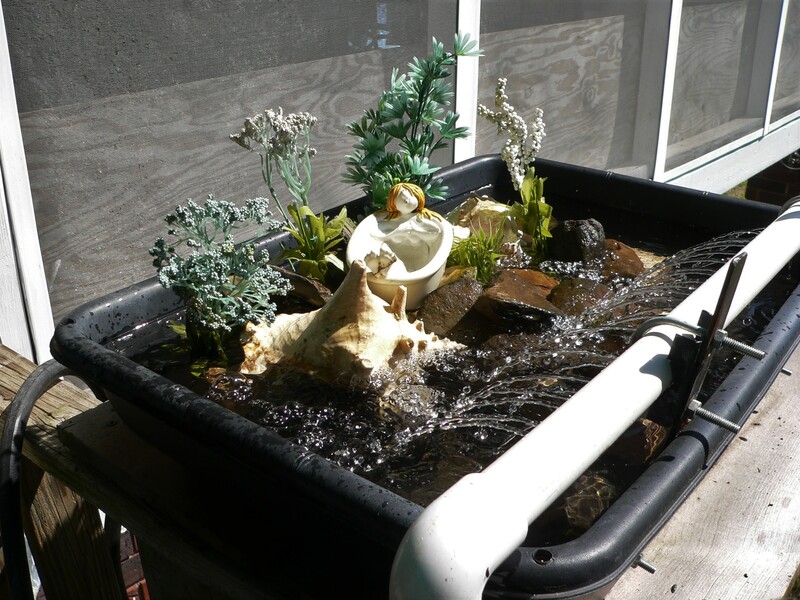 The system is set up to recycle the water, only using more water if the level in the trashcan goes down below a certain point, at which time the hose automatically turns on to add the needed amount. The PVC pipe is drilled with holes to make the spray. The system is on a timer, so it starts up at about 8 am and turns off at about 8:30 pm. I’ll put out feeders this morning, just in case we have some hummers around. 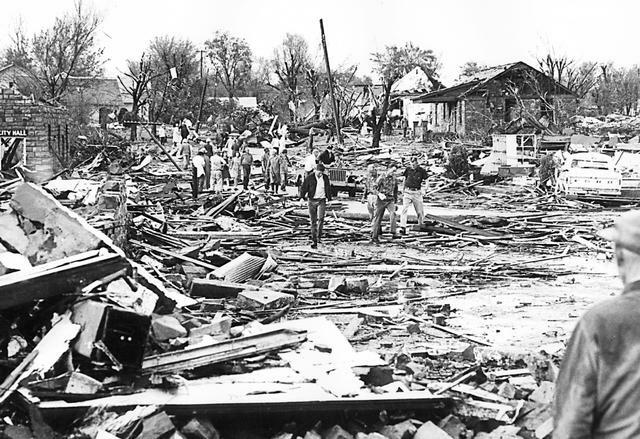 April 19, 2018 marked the 50th anniversary of a tornado that practically wiped Greenwood, Arkansas off the map. It happened just after school let out on that day in 1968. 13 people died and hundreds were injured. Half the town square was obliterated, the tornado blowing away over 400 businesses and homes in the space of 4 minutes. On April 19th of this year commemorations were held all over the city. Books were published by the Greenwood Democrat that we could buy, showing photos and giving details of that day. Farmers Bank also published a book that they were giving away to citizens. People gathered to see a video, ask questions of the survivors, and appreciate what happened. Others gathered at the square. Survivors recounted their memories of the day that devastated Greenwood. The tornado was national news in 1968. They figure now that it was an F4 tornado. Through the tragedy, though, people rebuilt. Survivors with homes intact offered rooms, clothes, and food to those who needed them. Ham radio operators helped with communications. Surrounding towns provided help. Help was offered from far away, as well. There were 2000 residents of Greenwood in 1968. Today there are around 10,000. Instead of giving up and going elsewhere, the strong people rebuilt the town, building a stronger sense of community than ever before. The photos of the devastation tear your heart out. The people of Greenwood were stronger than 4 minutes of Mother Nature’s wrath, though – stronger than anyone knew. My husband and I found Greenwood, Arkansas when he took a job in Fort Smith in 1987. We feel lucky to have found such a wonderful place to live. We went to the 31st Annual Greenwood, Arkansas Car Show yesterday. I think it gets larger every year as word of mouth spreads about how enthusiastic we are about incredibly restored and souped-up cars. Proceeds go to local scholarships and charities. There are the wonderful cars of all types, models, years, of course, and there is food and drink, country music, door prizes and awards given in several categories for the entrants. Many of the cars are for sale. The good businesses around the square shut down for something like this, knowing that the events are good for the town, the charities, and fun for the people. They close off three sides of the square to traffic, allowing the main road to stay open. 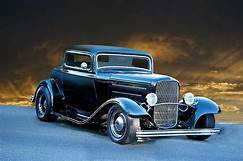 My favorite is always a 1932 Ford Deuce Coupe. There is something about the size and shape of that vehicle that calls to me. 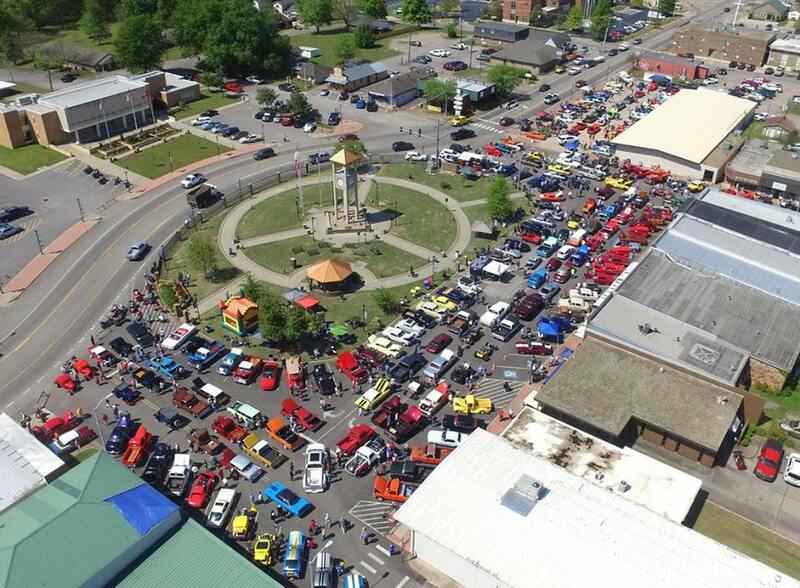 The 1st Greenwood AR car show was in 1987, the year we moved to Greenwood and had our home built. It has been wonderful to watch it, and the town grow and thrive. Yesterday I showed you the first harvest from our spring veggie garden. I’m delighted that everything seems to be happy so far. 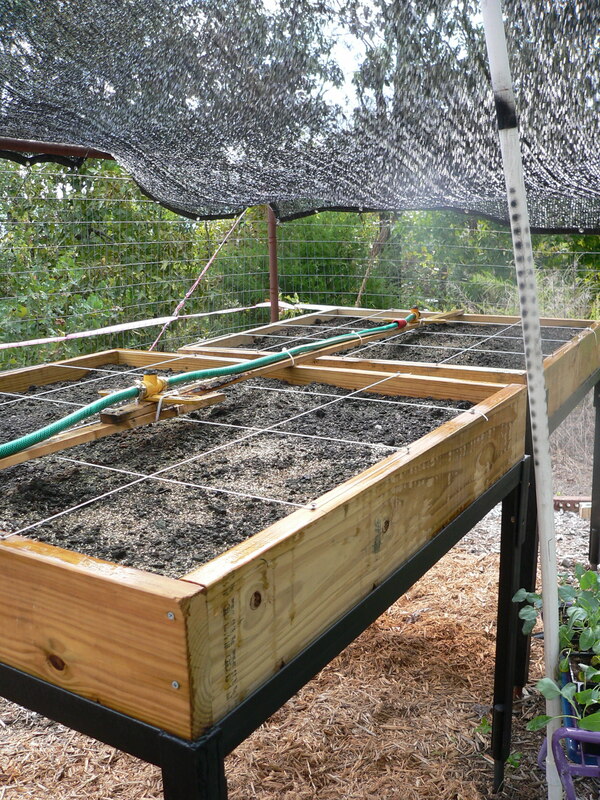 The raised bed square foot garden consists of six 4’x4′ wooden boxes about my chest level filled with Mel’s Mix (a combination of peat moss, vermiculite, and three or more kinds of compost.) The boxes are divided into ‘squares’ by stretched string. I have opted to space things out a lot more this year because I lost a lot of produce by having the plants growing into each other. I decided to opt for a lot more air and space for each plant and see what happens. 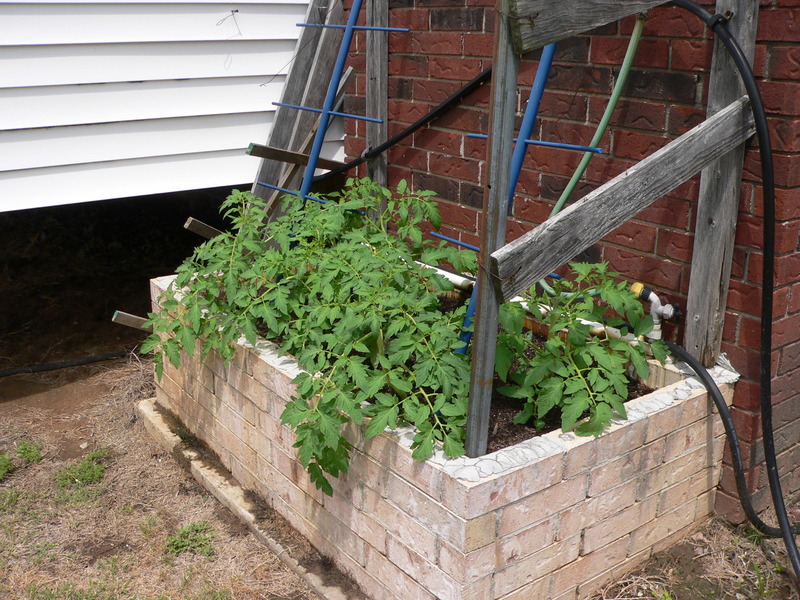 We also have tomato plants in two converted brick planters on the other side of the house. 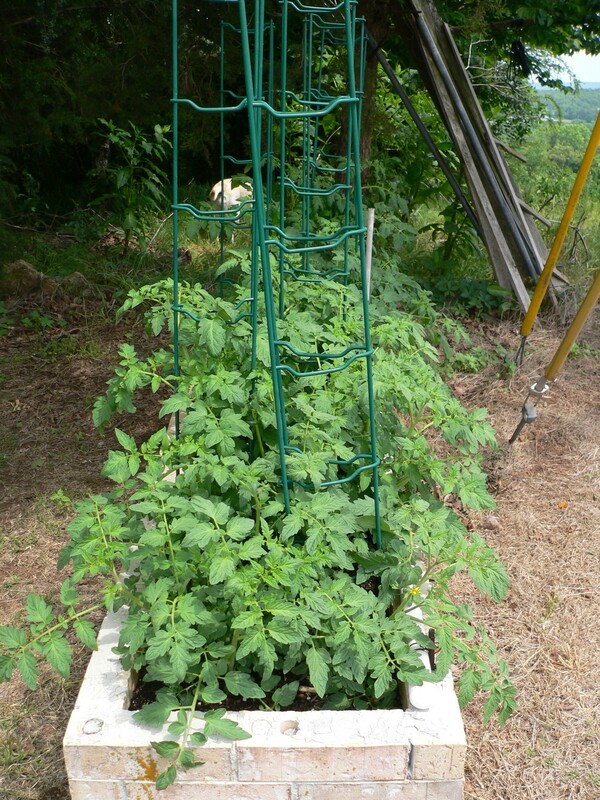 We’ll plant another group of tomato plants soon so that we can space out our harvest and extend it as much as possible. 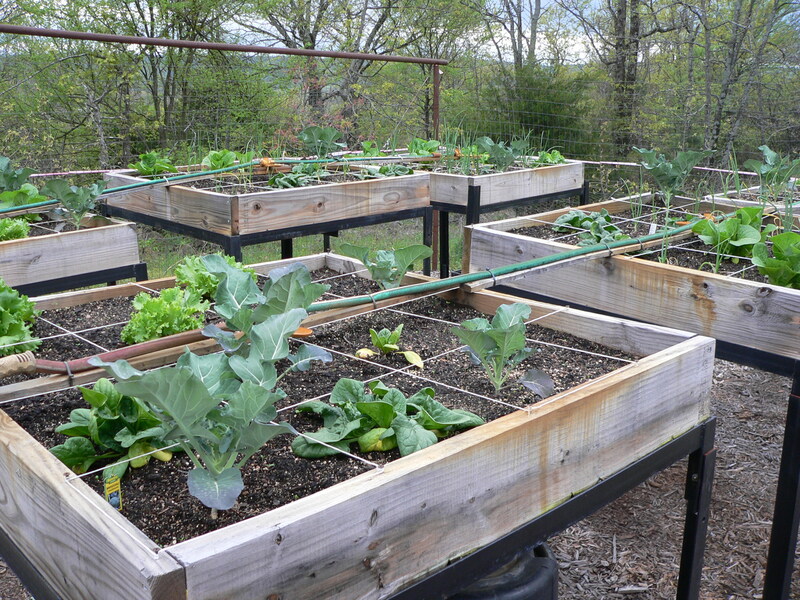 Each box has a sprinkler in the center that are connected by pieces of hose. These are all tied to a main hose that connects to a rural type outside faucet. 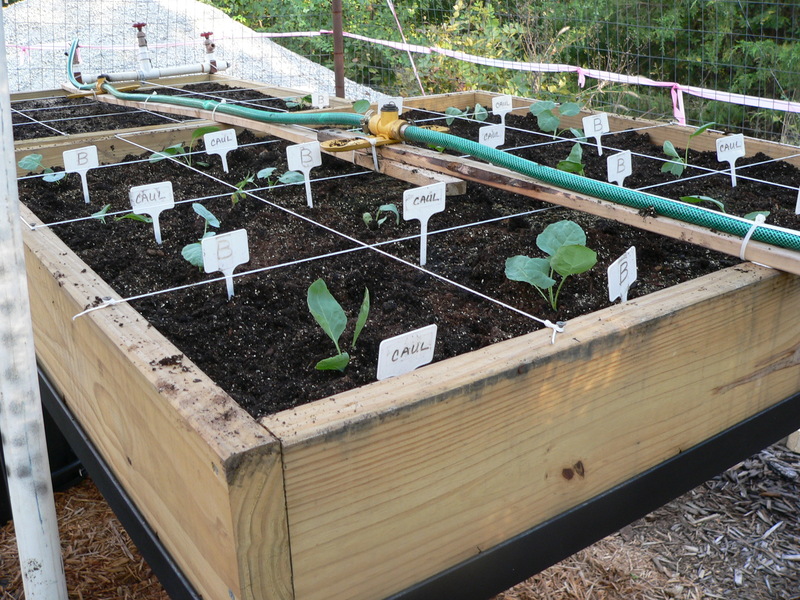 We put a timer on it so that the garden is irrigated each morning. 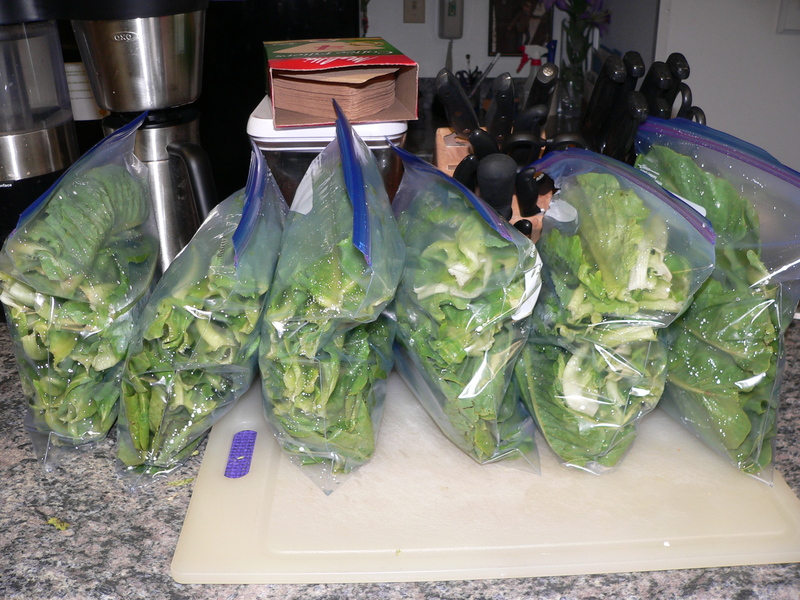 I’m going to wash spinach, romaine, and iceberg lettuce for our salad today harvested yesterday from the garden. I hope that one day we can eat our own broccoli! I grabbed my camera to take a picture of the entertainment center and the winterized deck for the previous post. Amber, of course, wanted to come with me. 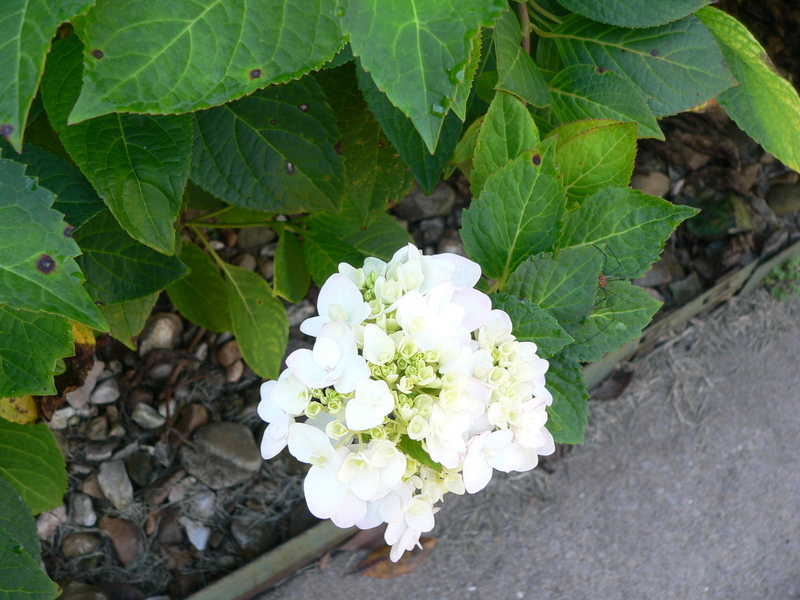 We ended up walking all over yard, taking pics of flowers, veggies, etc. 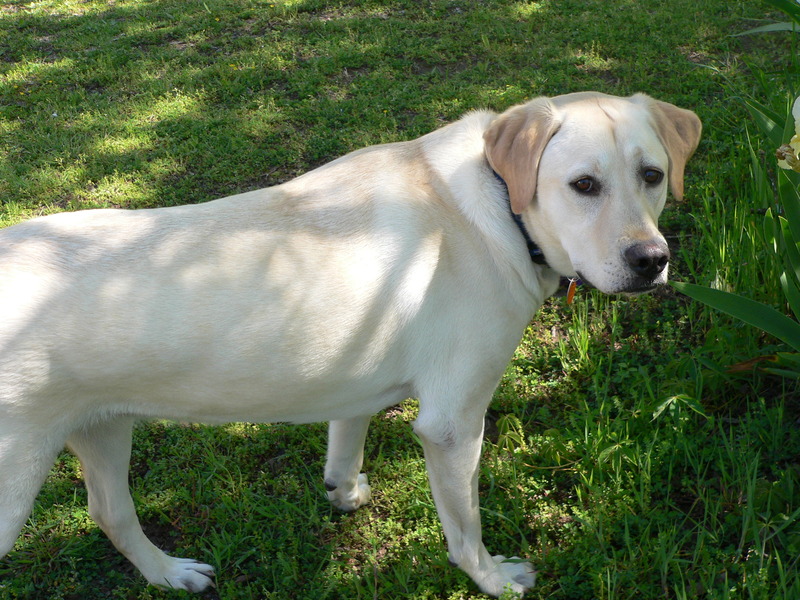 Amber would watch me, then run off and do doggly things for a while, and then come back on her on, or when I called. 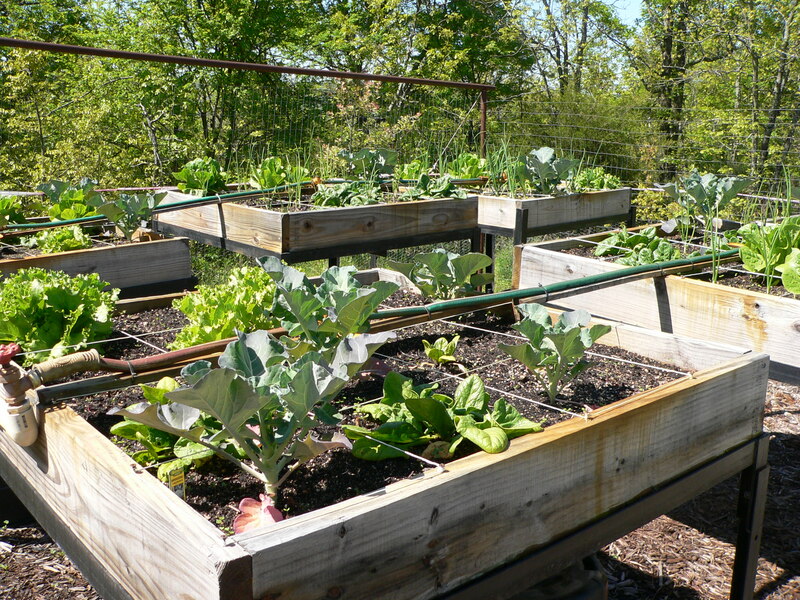 We did this over and over, walking out to the greenhouse, then all the way across our land to the square foot garden, then back around the house. Amber is a really sweet, wonderful dog. I particularly enjoy her when it’s just the family here. 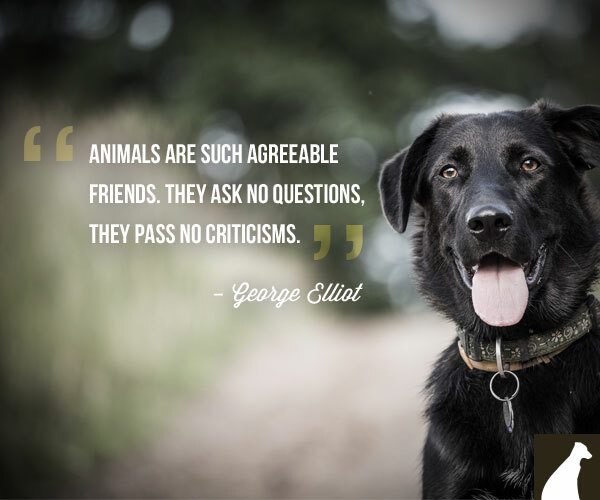 She responds eagerly – probably in anticipation of a ‘cookie’ when we go back inside – but is truly fun, affectionate, curious and playful. (It’s when others come here, or we go out in public that she tends to go ‘maniac,’ requiring all our tools, skills, and dubious intelligence to handle things. We have agreed that we need to invite more people here, and put the no-pull collar and leash on her when she is allowed to get out of the car on our outings, giving her more occasions to meet people, LISTEN to us, and hopefully, do what we say. 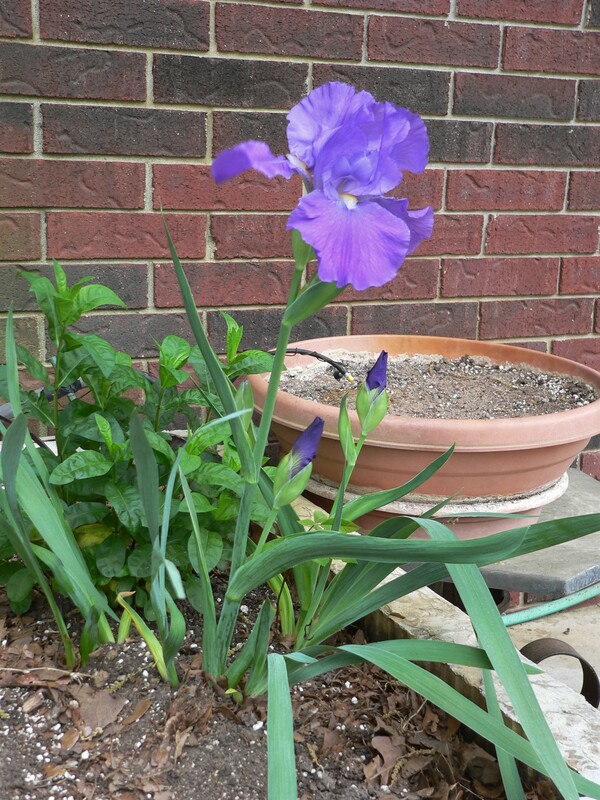 Deep purple iris are our favorites (although I like a lot of other colors). 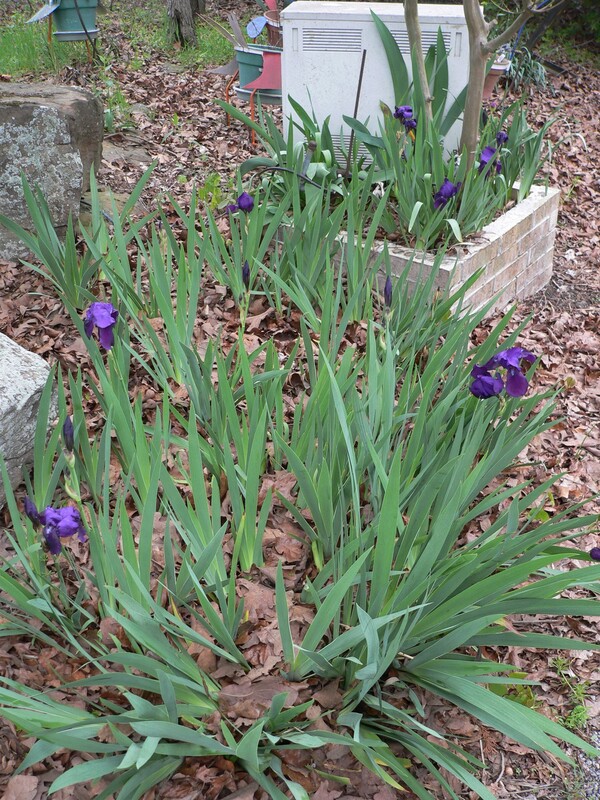 I’ve been working on trying to spread the purple iris all around the yard, since my husband loves them above all others. 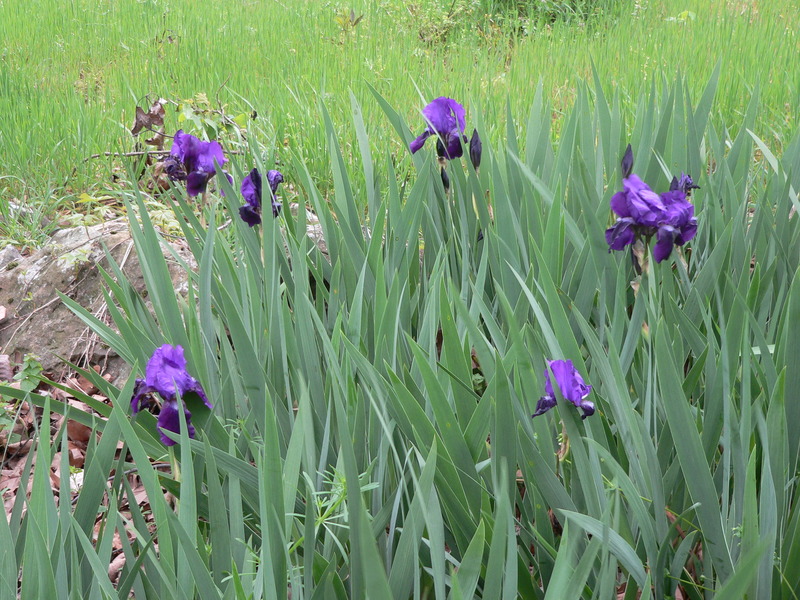 Right now we’re feeling rich in purple iris! This is toward the top of our driveway, on the right as you drive up. We have an antique computer tower perched on one of our brick planters. My husband put it there as a conversation piece years ago, but the birds now build nests in it each year. You can see some parts of the ’emu’ planters just past the brick planter. 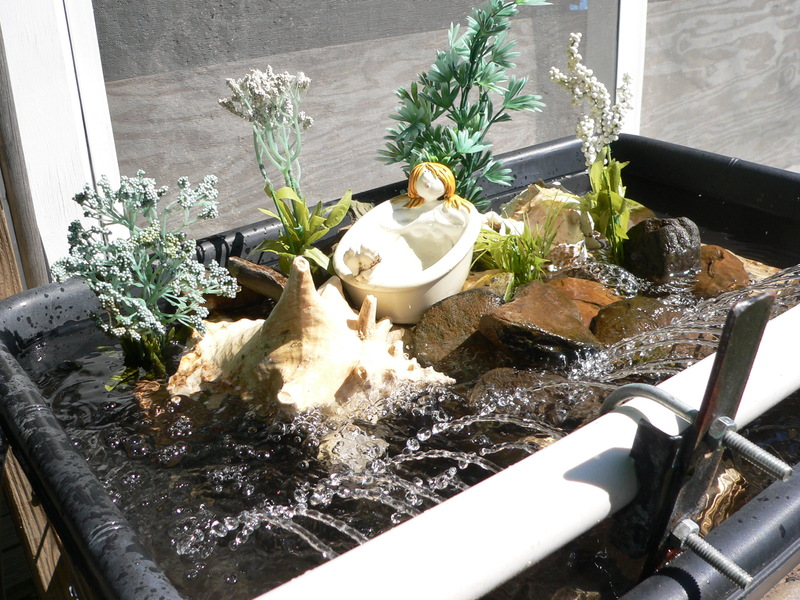 We’ll place my husband’s favorite periwinkles in those as soon as the weather warms up. 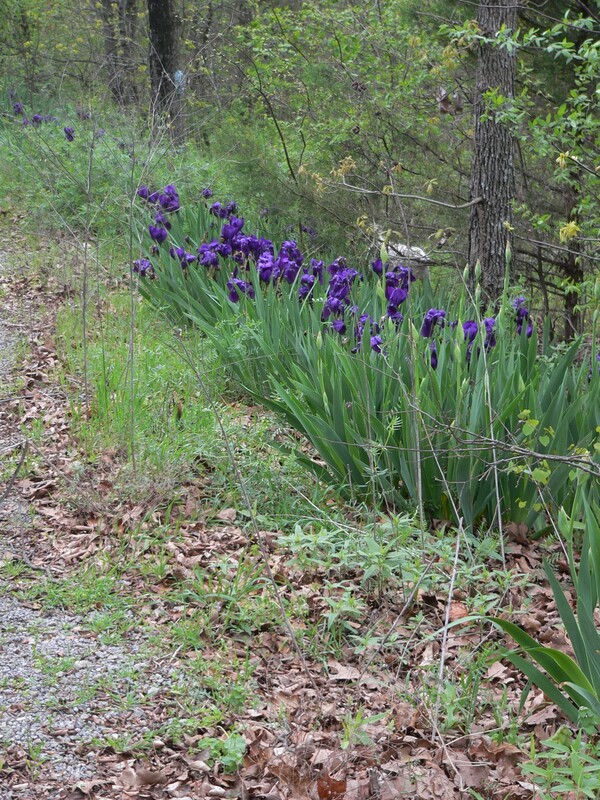 This is one of the clumps of purple iris that are finally happy along the side of the driveway. 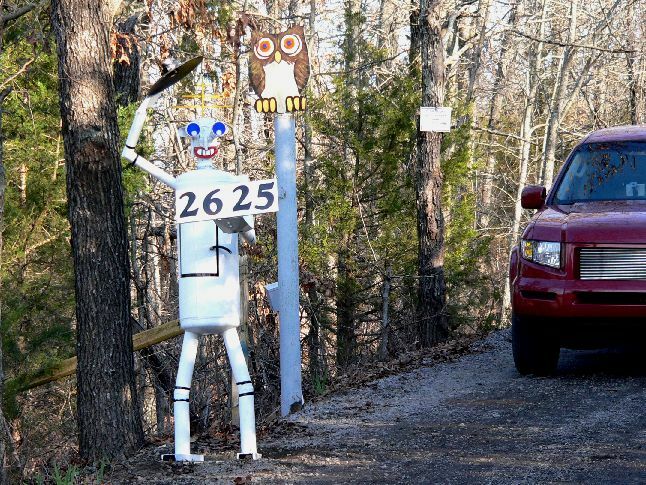 They make us smile as we go down the driveway. 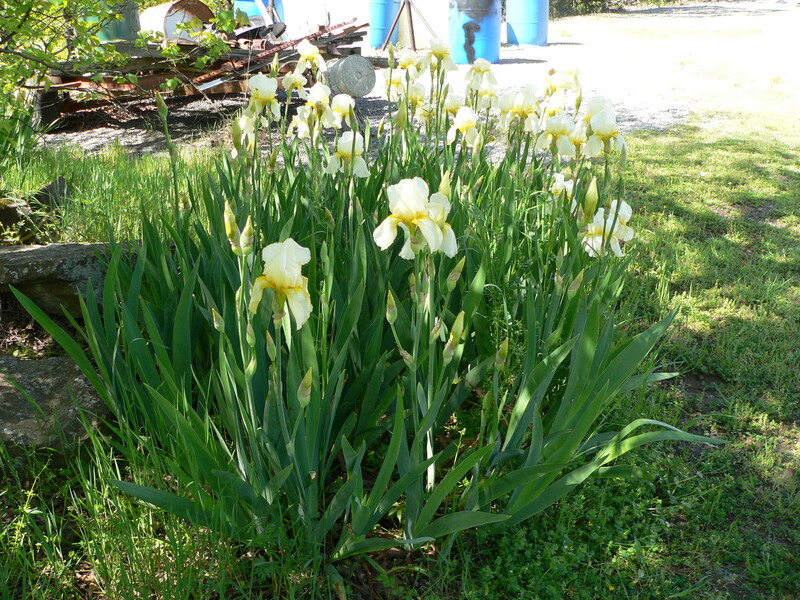 My husband remarks about them each time he sees them, thanking me for transplanting some there. We had bad storms with a strong cold front Friday afternoon and evening – including tornadoes, damaging winds, rain, hail, and flying hair balls. 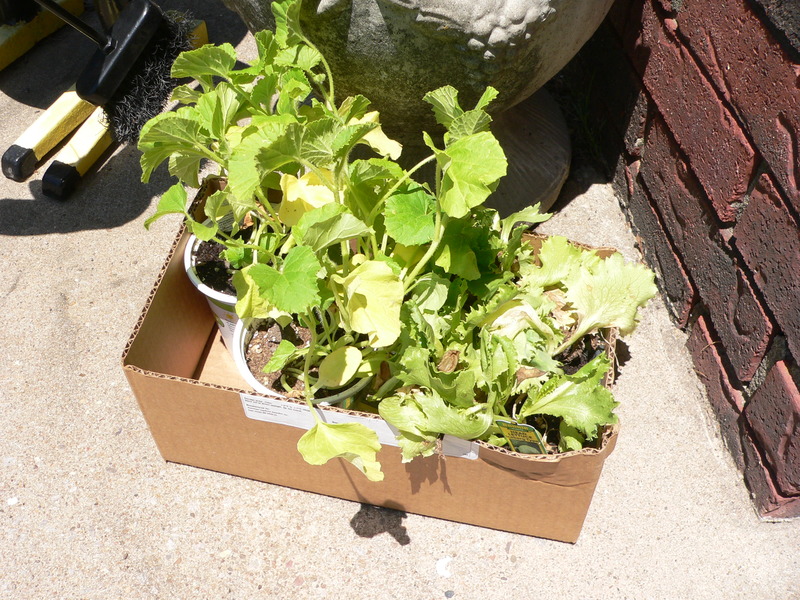 I was worried that my fledgling square foot garden plants would get battered. Yesterday and today we’ve had cold temperatures for April in Arkansas – barely 40 and gusty north winds. As you can see, the garden is doing fine. WHEW! Thank goodness these are all cool weather plants! I may lose some of my tomato plants, but the rest of the garden is good. It’s almost time to start snipping! 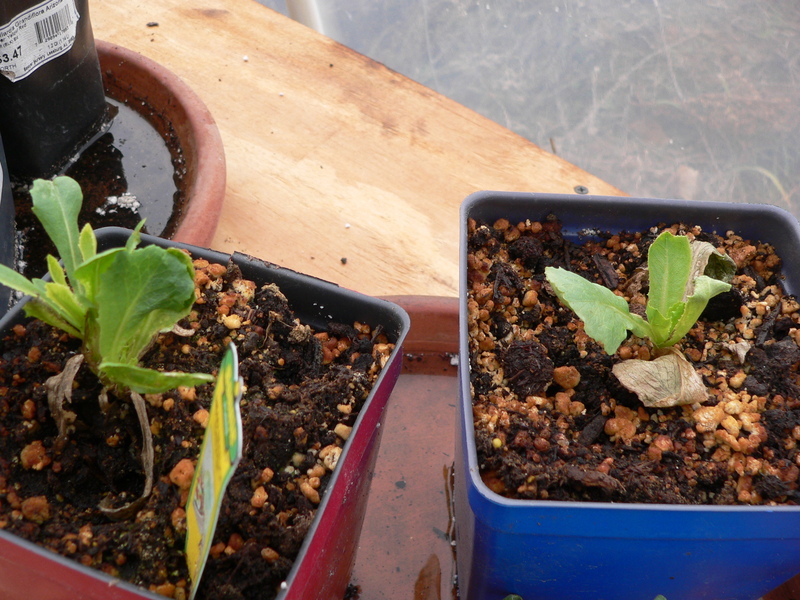 I can gather the outer, larger leaves of the lettuces and the spinach soon. As soon as it warms up a bit, I’ll get some radishes started. Mother Nature was in a snit yesterday afternoon and evening, bringing us a cold front with accompanying 60 mph winds, hail, rain, tornadoes, and flying hair balls. The sky was black in mid afternoon and I watched the hard-working local weather guys try to warn people in our area and all around us about when to dive for shelter. Happily, though we got wind and rain, all the bad stuff either went north or south of us. We came through her bad temper well. I checked this morning when I took the doggies out, that the greenhouse was still standing, we didn’t have any damage to the house, my roses were still intact, and the square foot garden was still looking good. 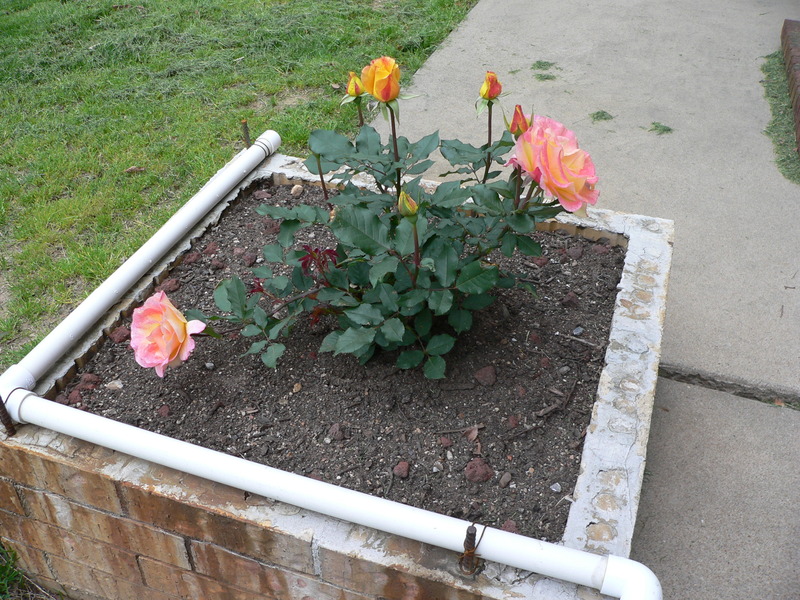 We planted 3 new rio samba rose bushes recently. I’m just thrilled that they seem to be happy. Even though it’s too cool to be comfortable outside today, I’m thankful to see the sun and our thriving plants.